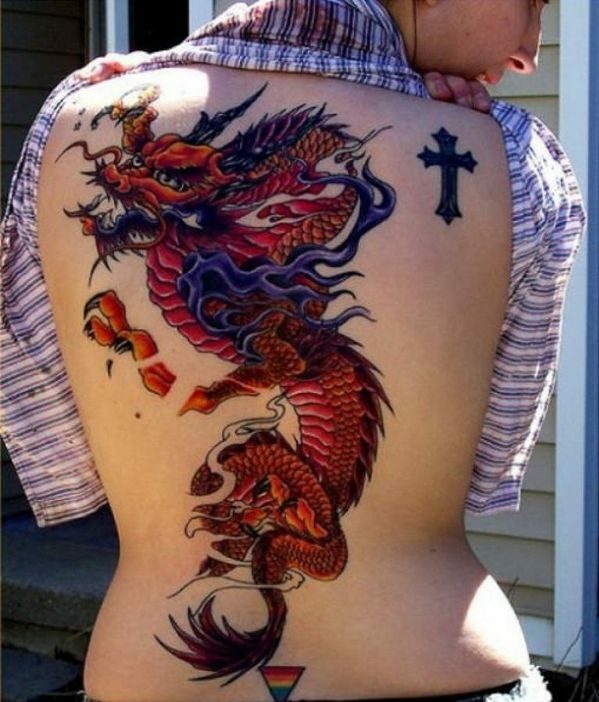 Everyone is given the free right to express themselves in any way they want. 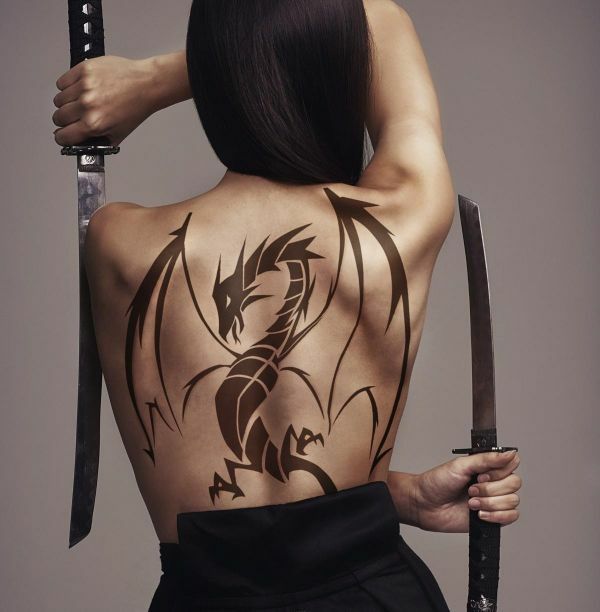 Whether you do it by your words, your actions, or your appearance, it will be a part of your personality, as well as a reflection of it. 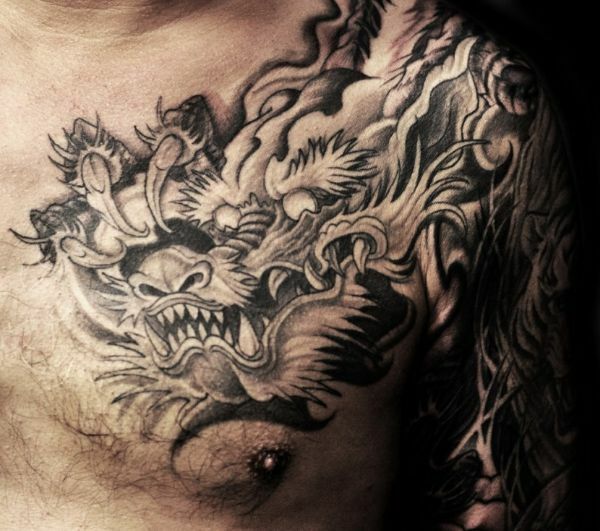 Tattooing is one blunt way of expressing yourself. 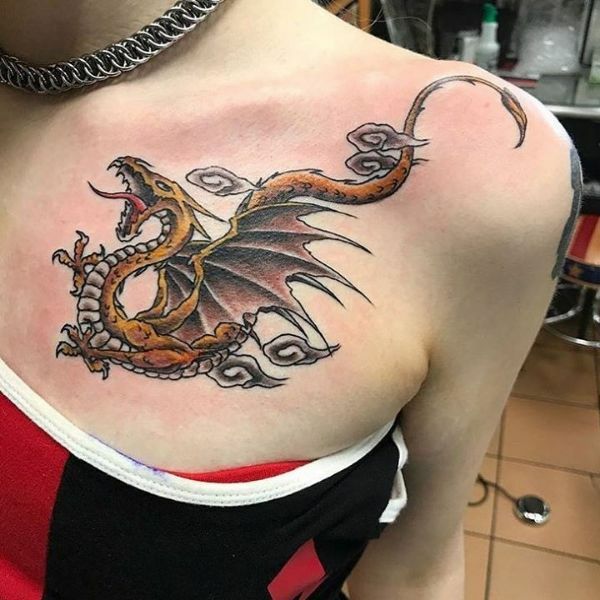 Tattoos are artworks you engrave into your skin, whether you want it to decorate your physique or symbolize something, and whether it may be an inked quote or a dragon tattoo, the purpose is served very well. 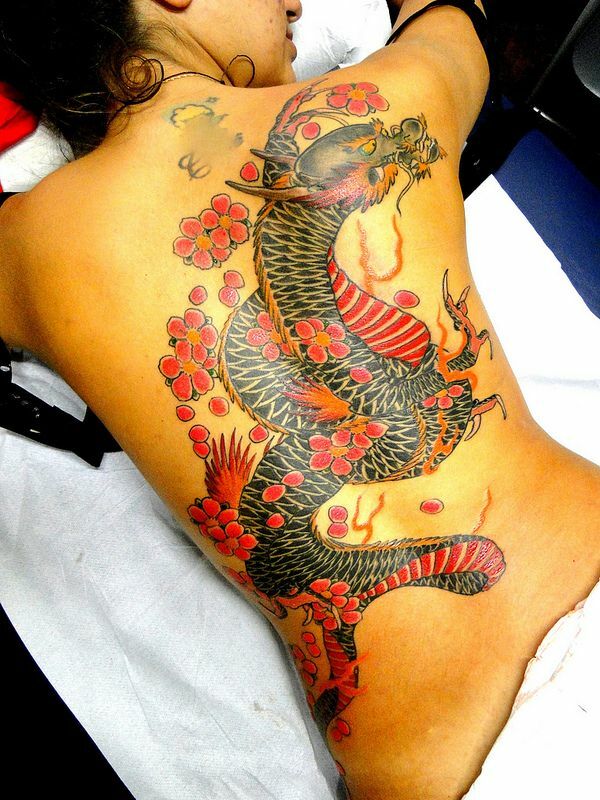 However, tattoos are a bit more special than just art sprawled on your skin. 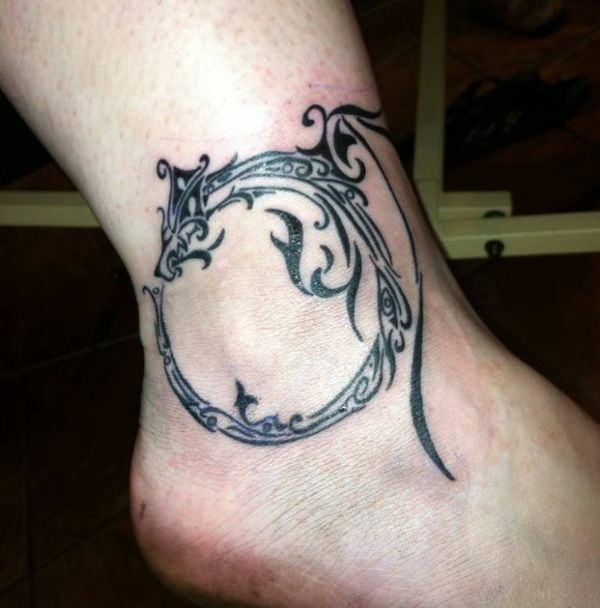 Being indelible, they are literally in your skin, almost permanently there and becoming a part of you. 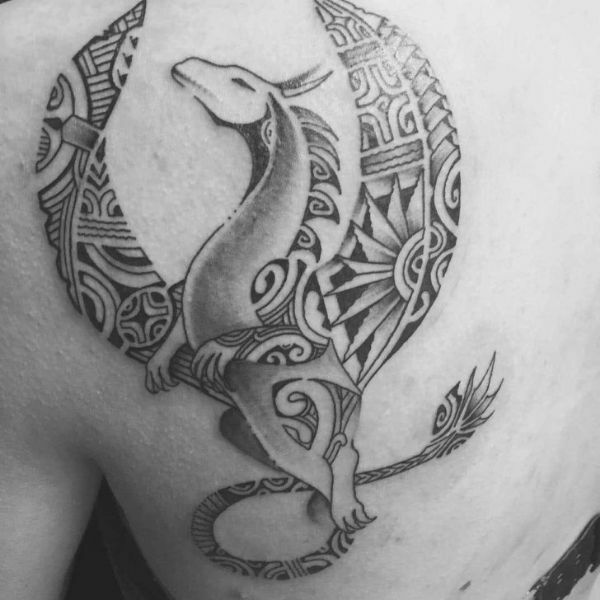 Therefore, it isn’t uncommon to give meaning to these tattoos or have them as a symbol of something you want to cherish for a long time. 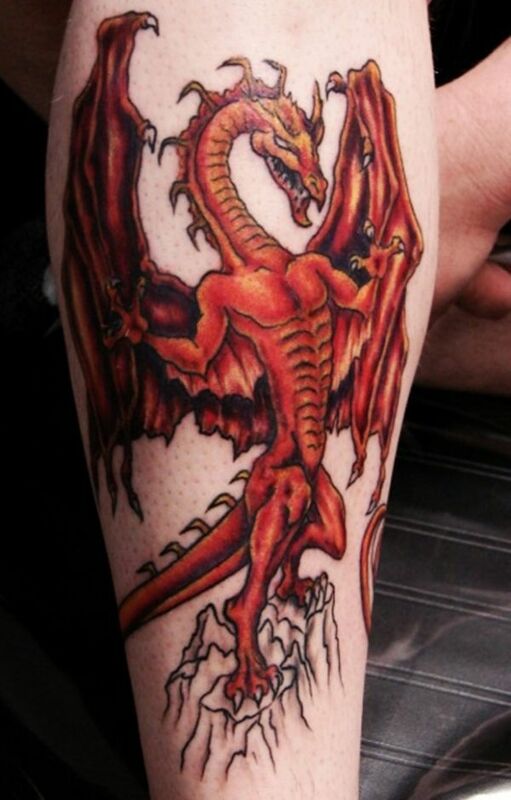 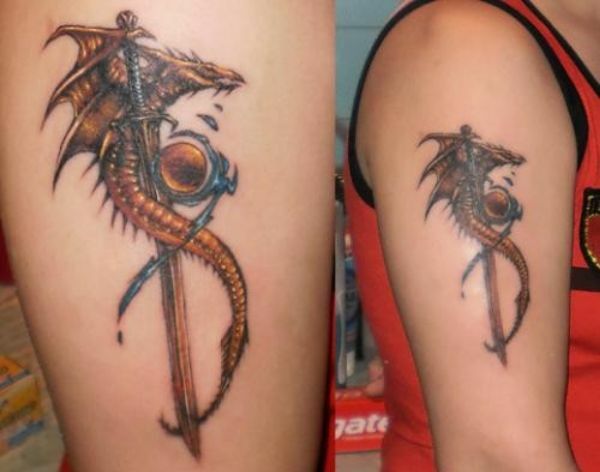 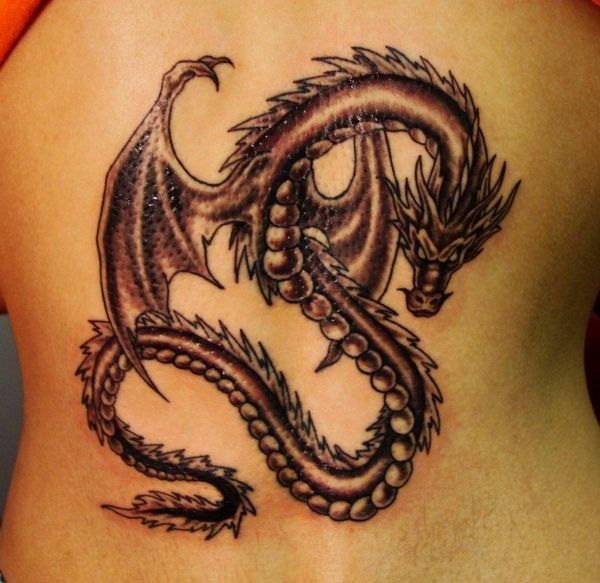 Here we collected the best dragon tattoo ideas with meaning and symbolism! 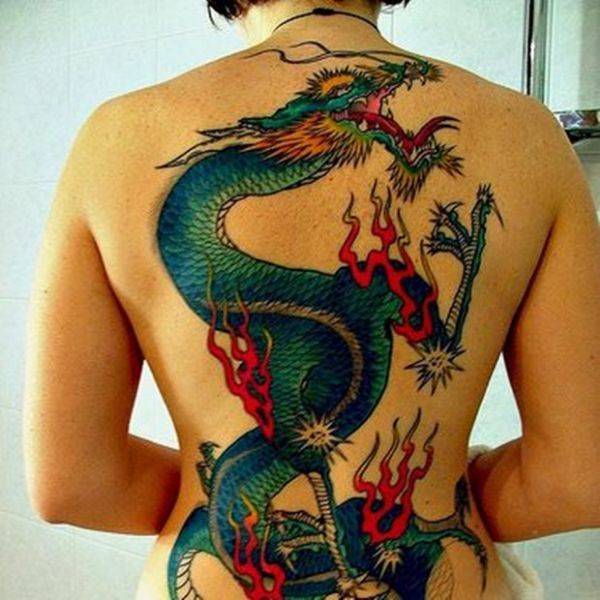 Dragon Tattoo: Where should you have it? 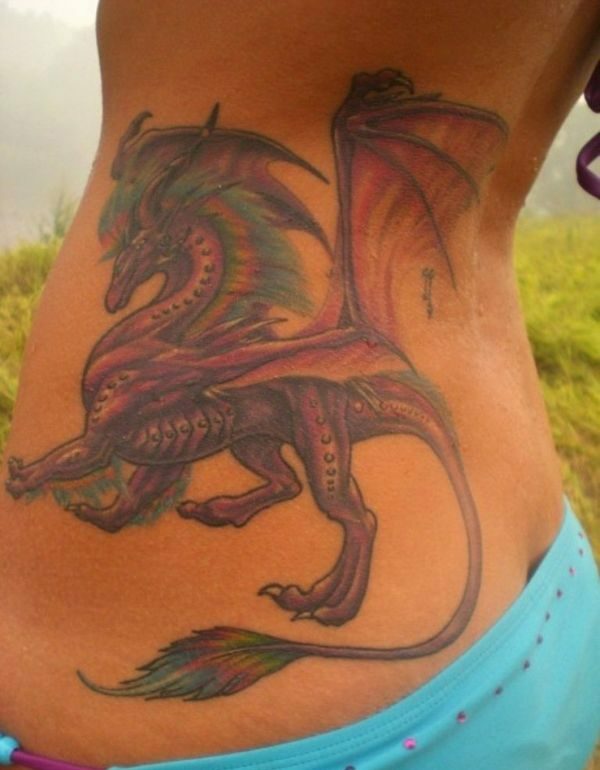 Dragons are mythical creatures with several depictions across civilizations. 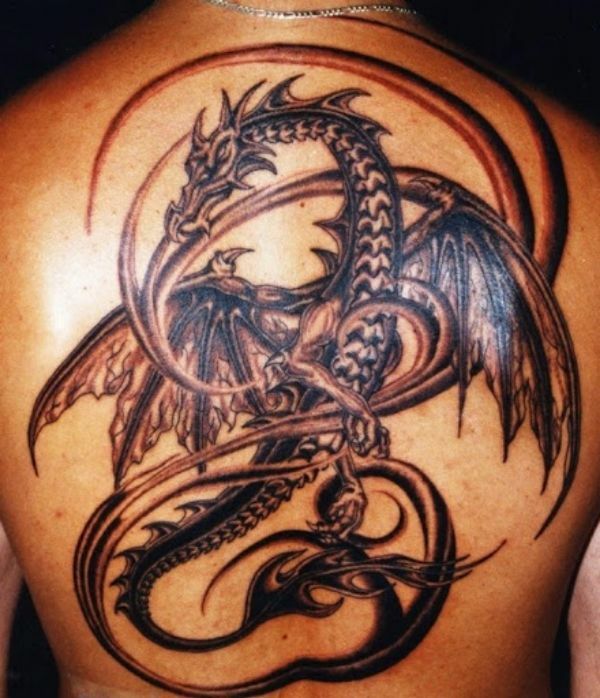 The general consensus regarding their appearance is that they have large serpent-like bodies. 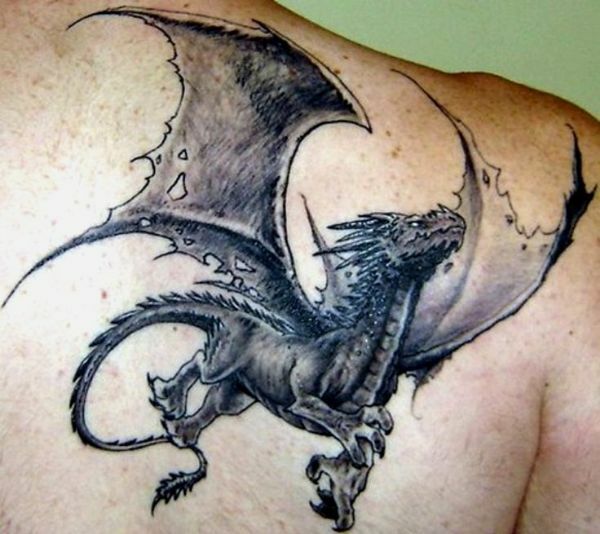 The dragons of the western culture are winged, horned, four-legged, and has the ability to breathe fire at will. 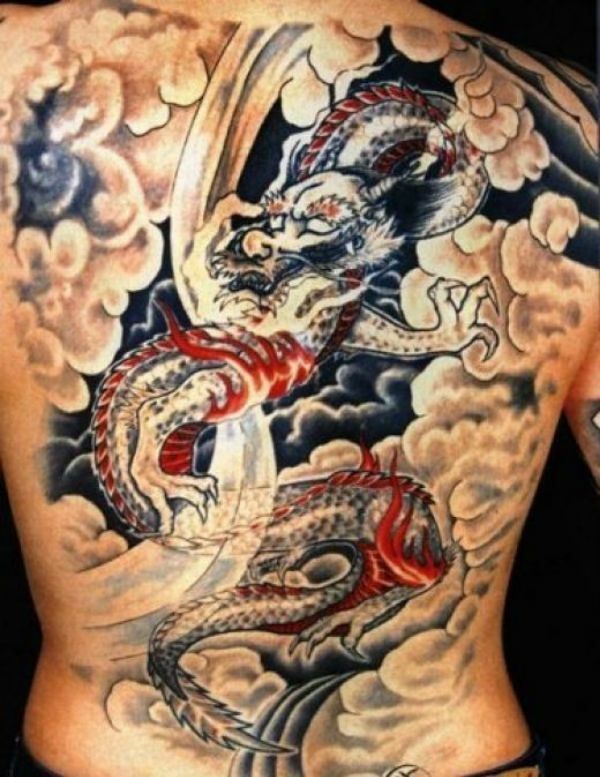 Dragons of the east, on the other hand, are wingless, four-legged, and resembles serpents more than western depictions. 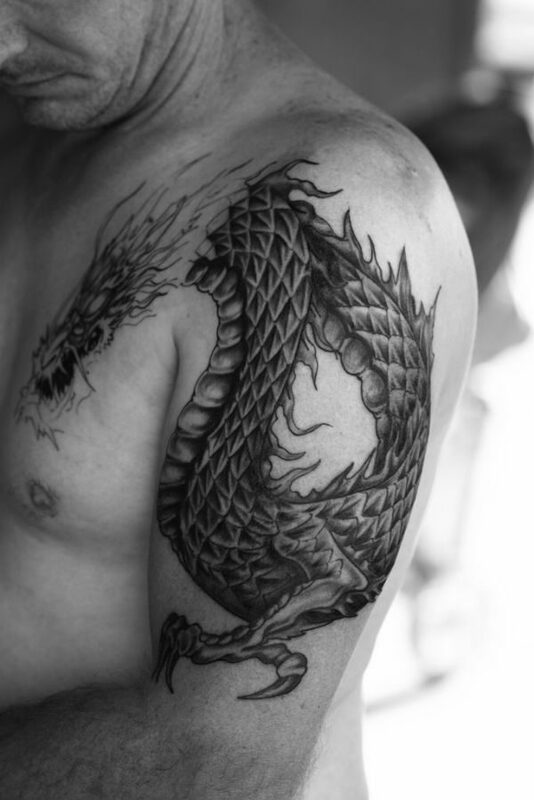 Western dragons are mostly considered to be ruthless and dark, while eastern dragons are thought to be noble and of high intelligence. 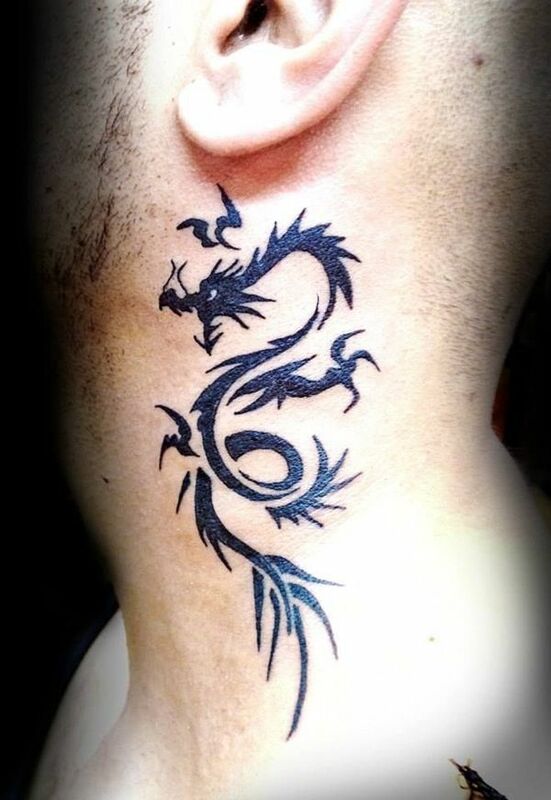 It is a common conception that dragons represent strength and power. 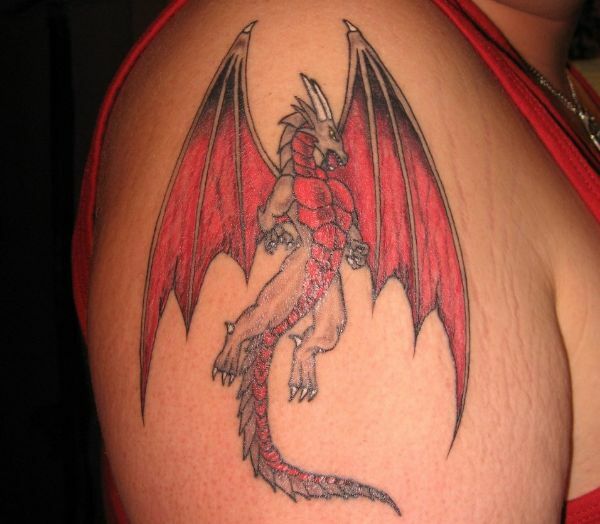 These beasts are believed to possess power so great they are either revered or feared. 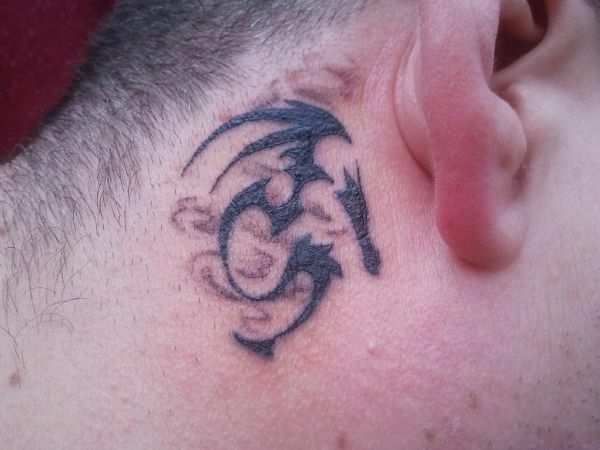 This belief is carried on to tattoos. 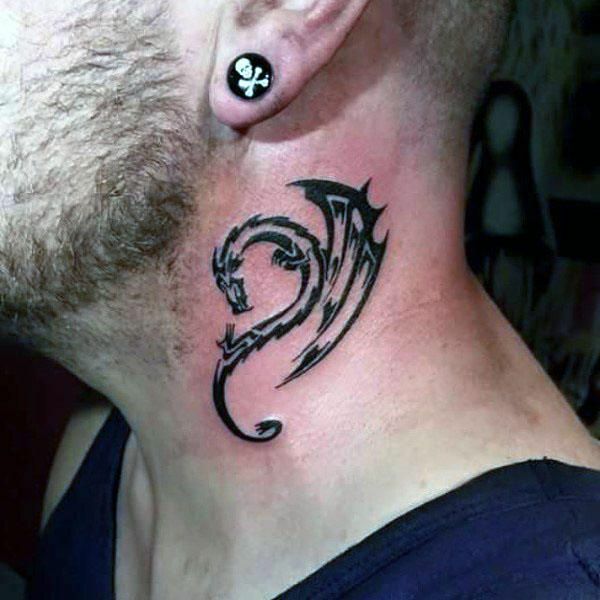 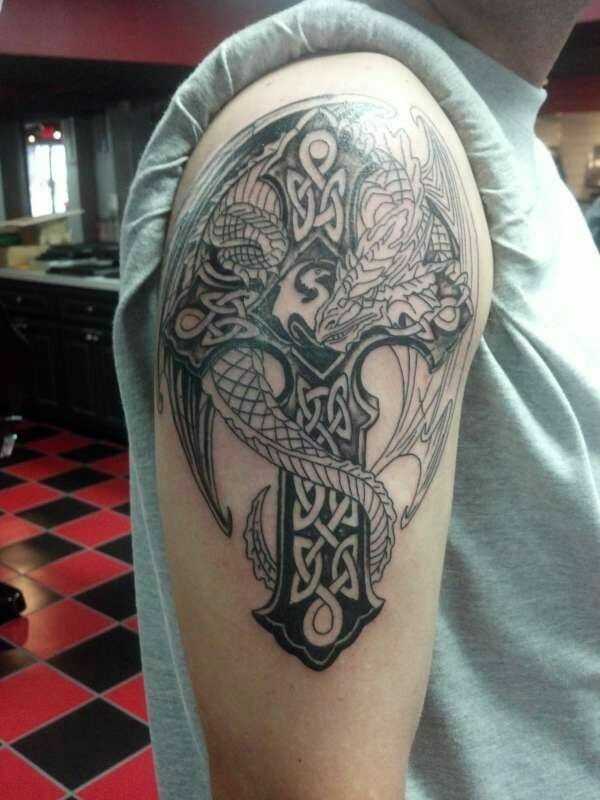 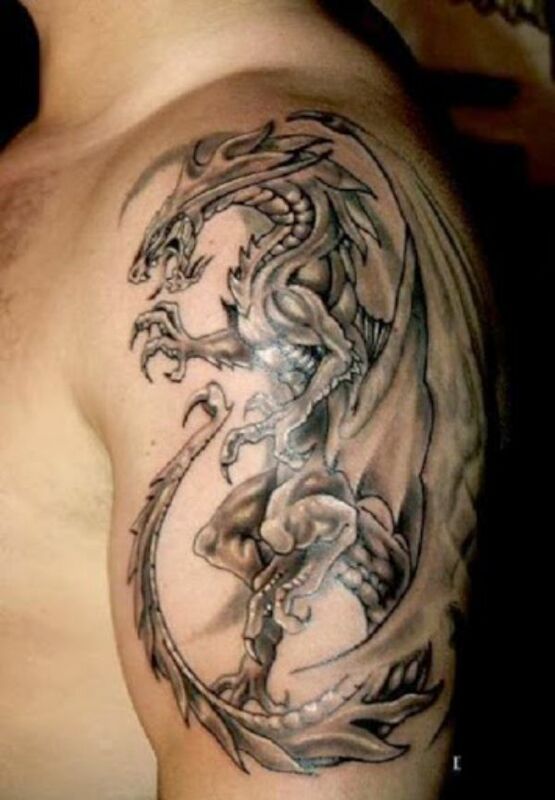 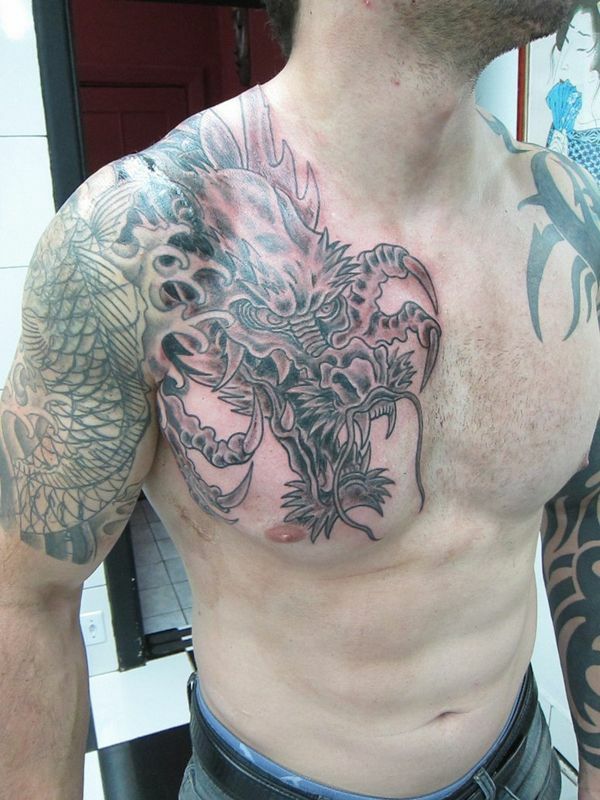 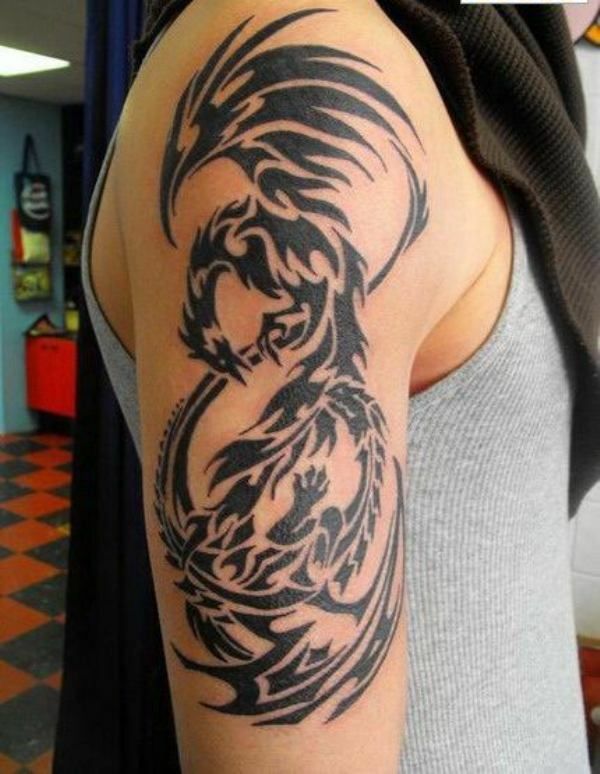 Dragon tattoos often represent strength, and anyone who has them can look intimidating. 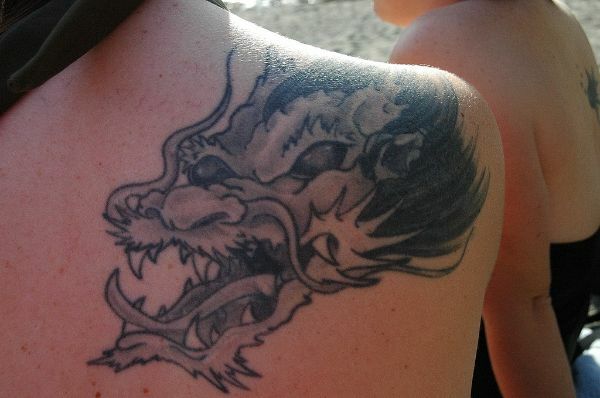 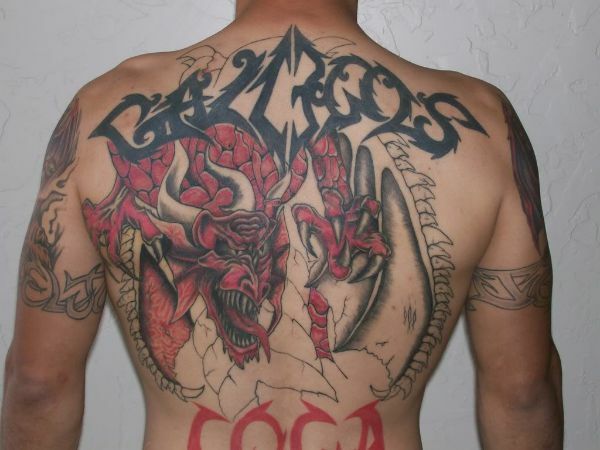 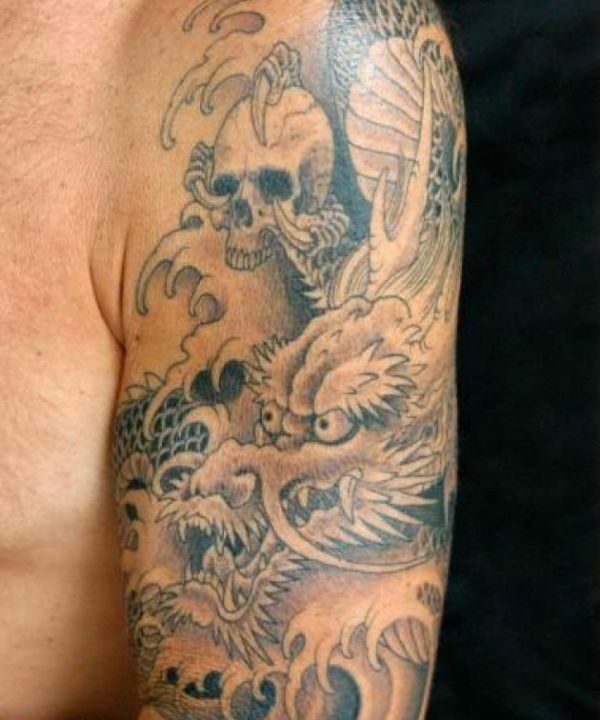 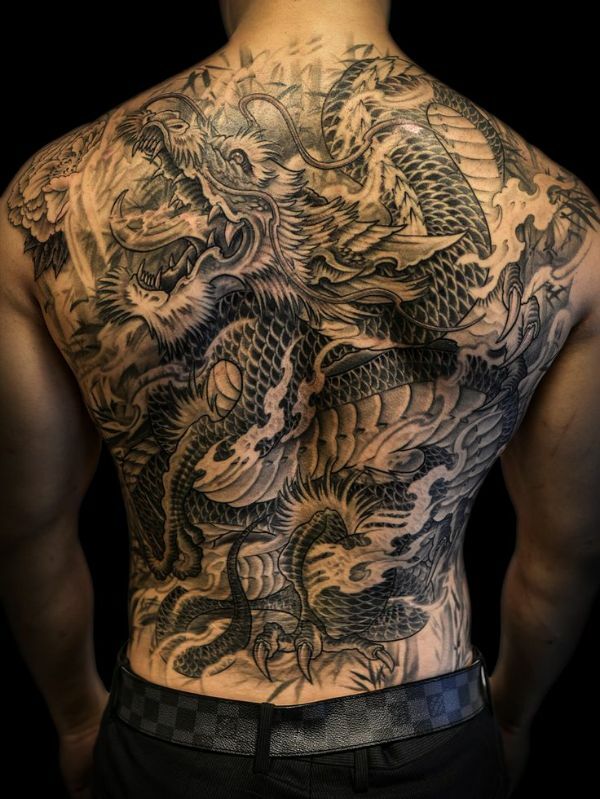 Criminals in Asian regions had dragon tattoos sprawled all over their bodies in one era, strengthening the association, although this practice has mostly died down or is not as prevalent nowadays. 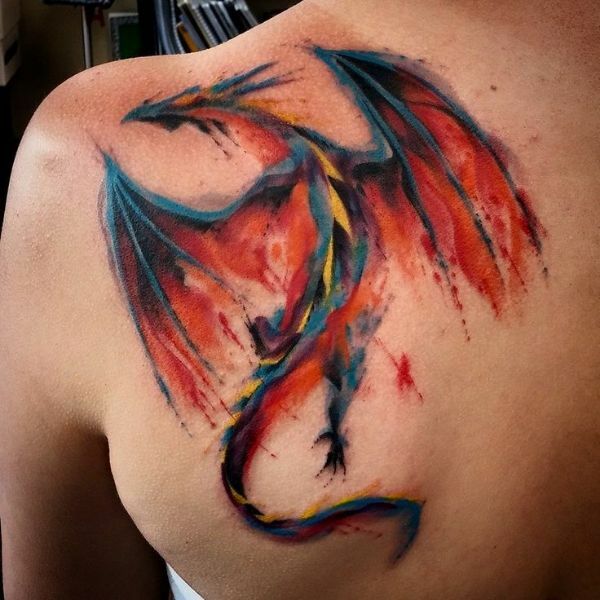 Milder tattoos can also mean freedom, as dragons are thought to be free creatures ruled by none. 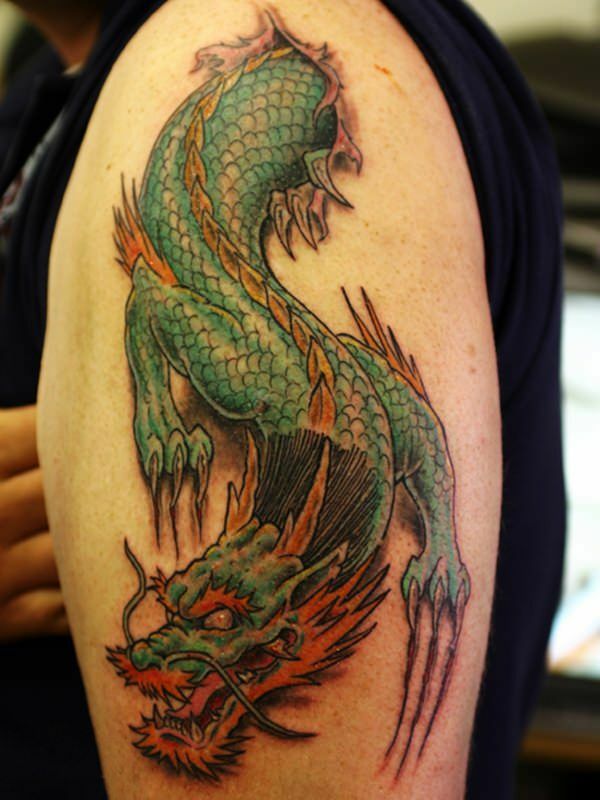 Asian dragons, in particular, represent balance, wisdom and good luck. 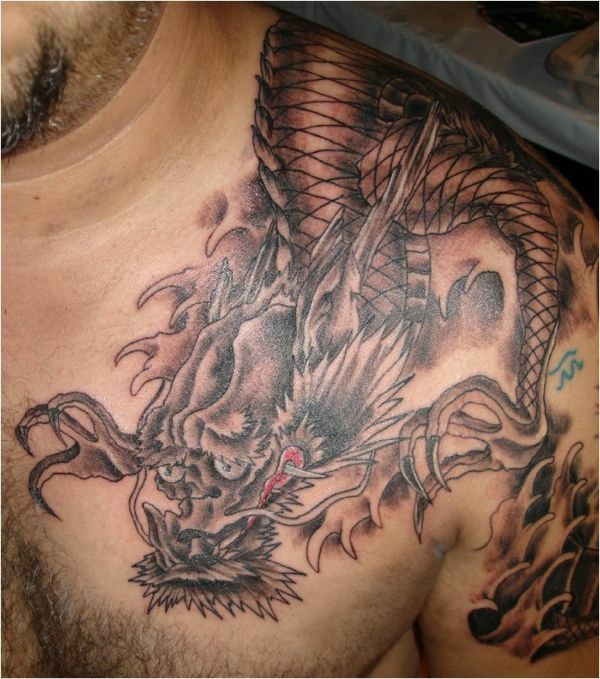 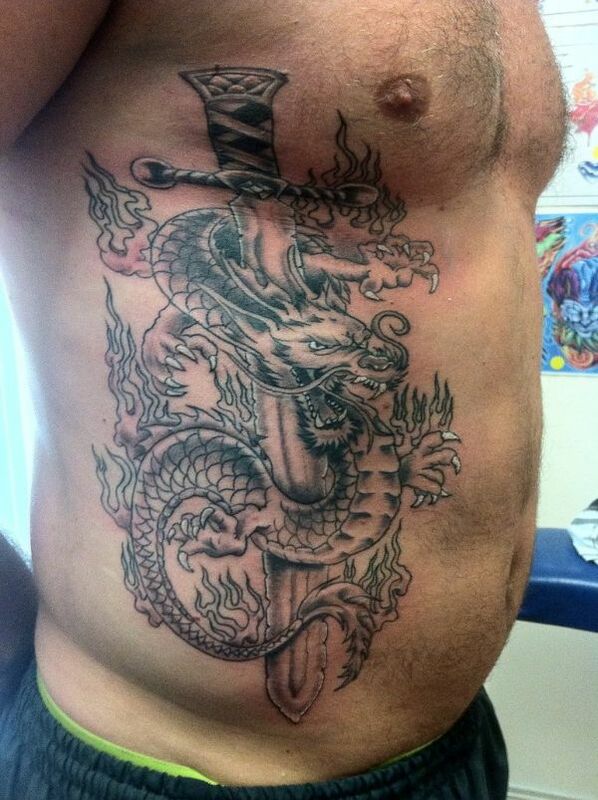 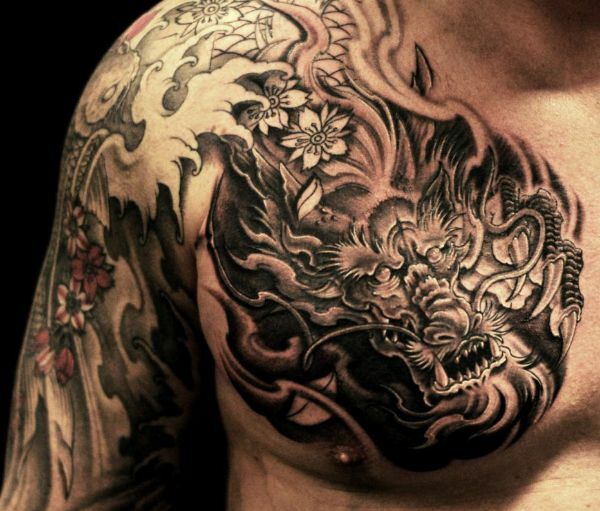 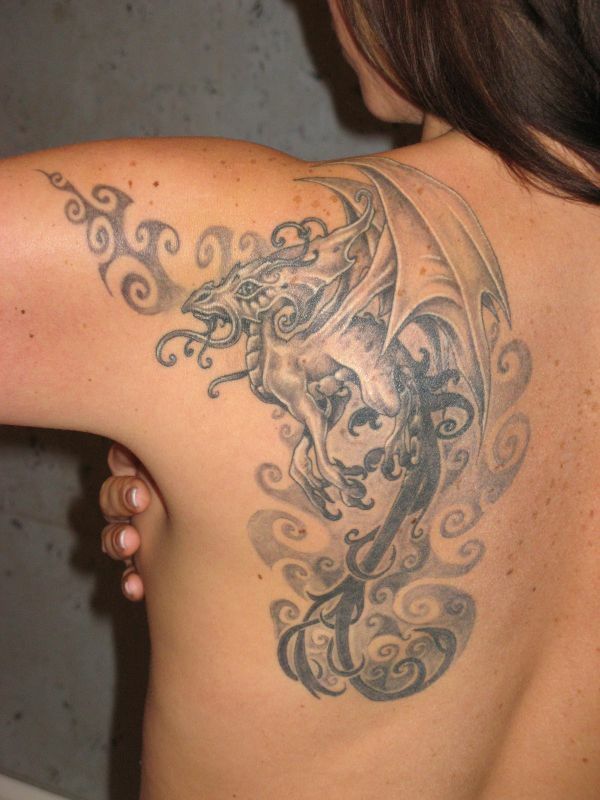 All in all, dragon tattoos are largely associated with enigmatic power. 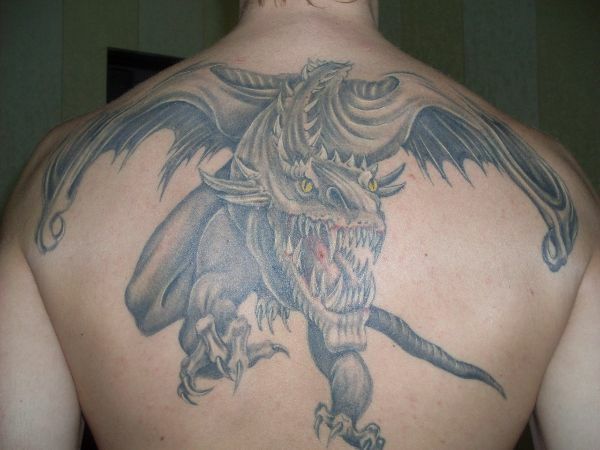 Power is also a common association to dragon tattoos. 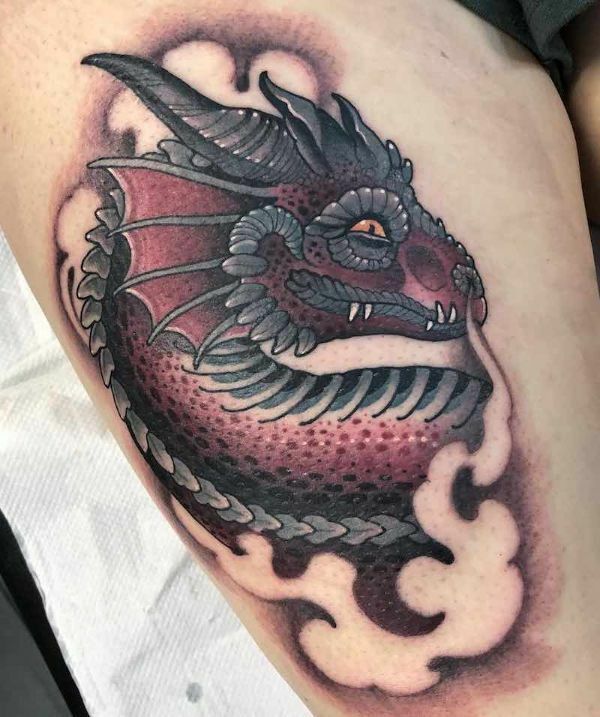 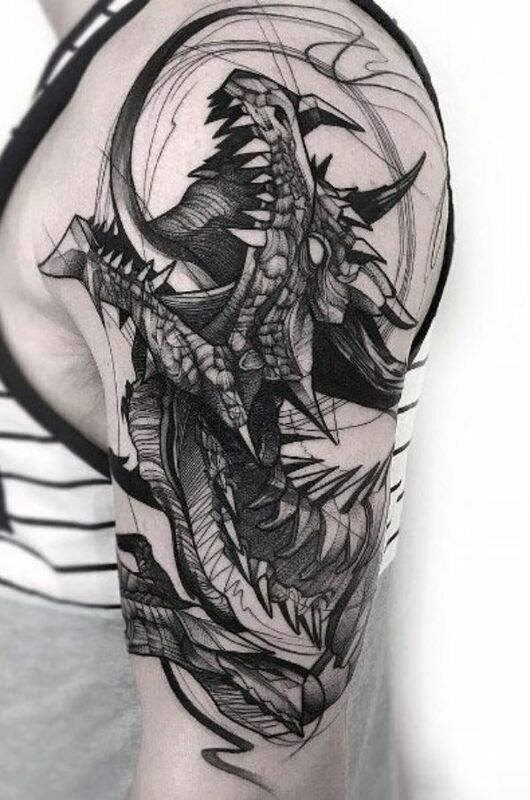 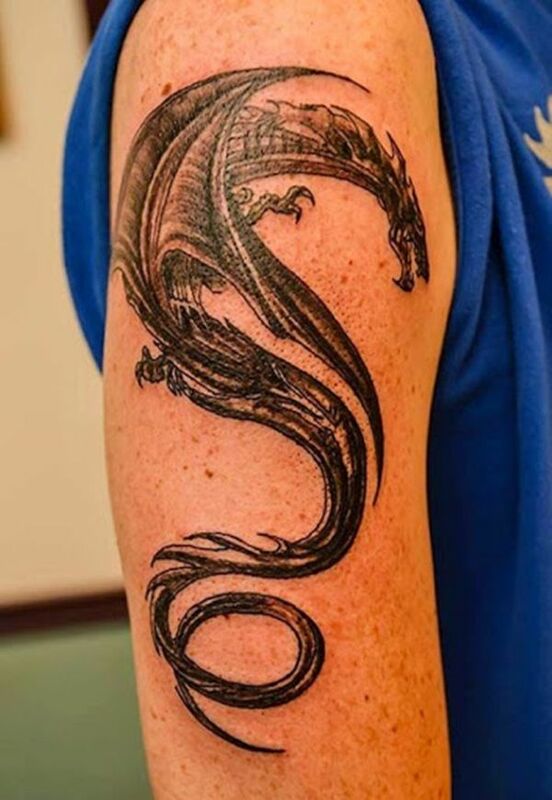 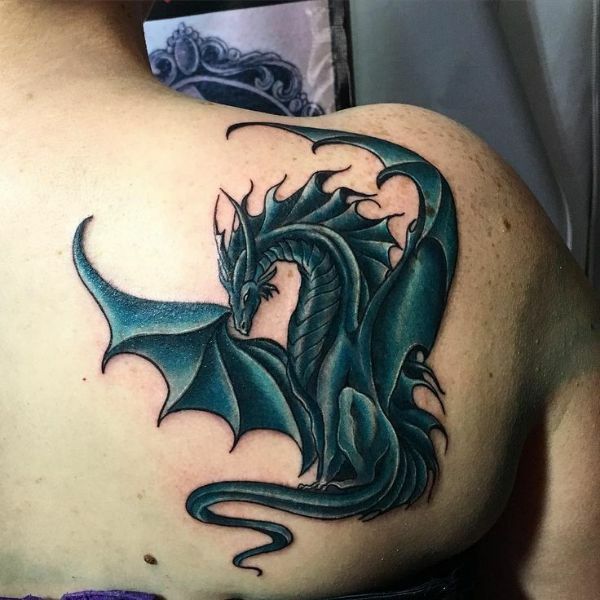 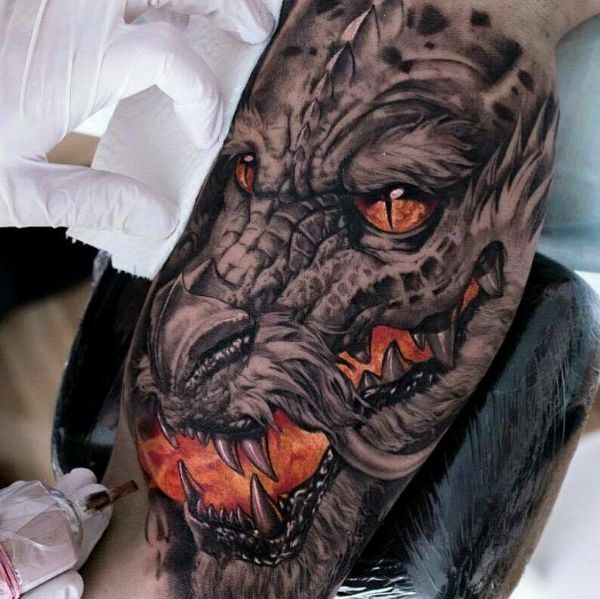 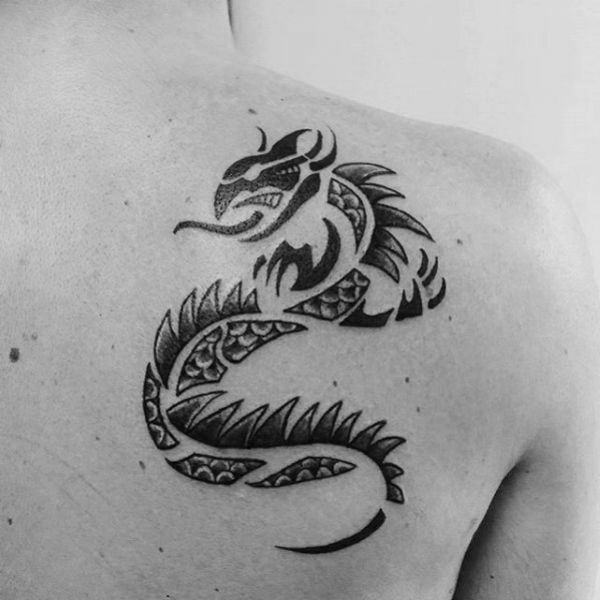 Since dragons do not have a universal image to follow and civilizations have their own depictions of them, there are quite a number of dragon tattoo ideas you can choose from. 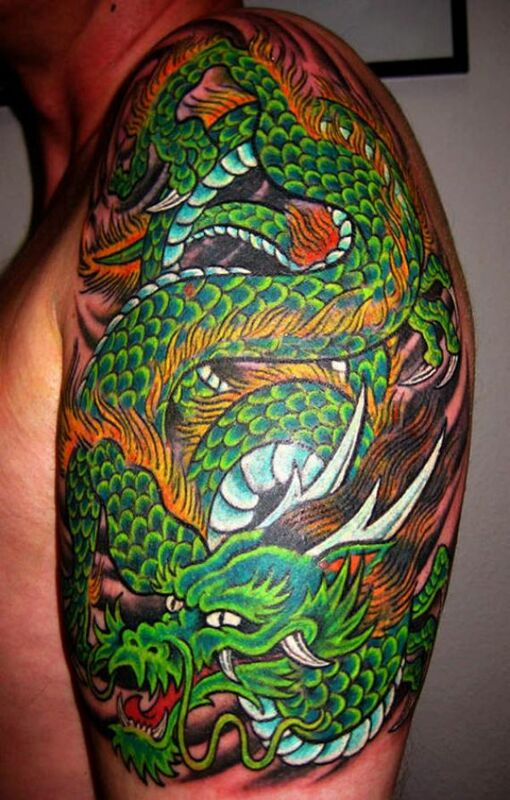 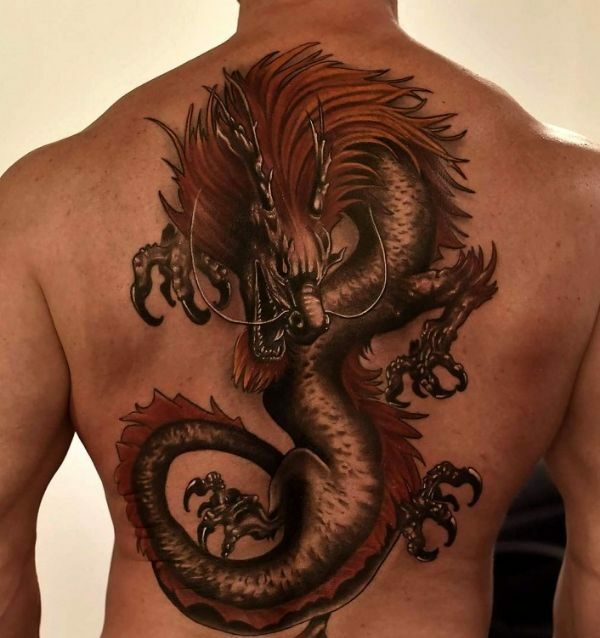 Below are 170 dragon tattoo ideas and inspirations to get you fired up on the dragon tattoo you want! 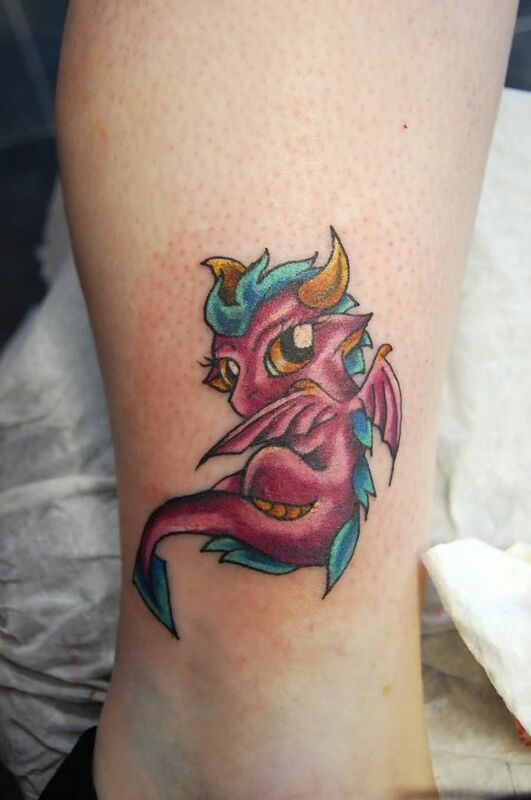 This tattoo is inspired by a monster card from the Japanese franchise Yu-Gi-Oh! 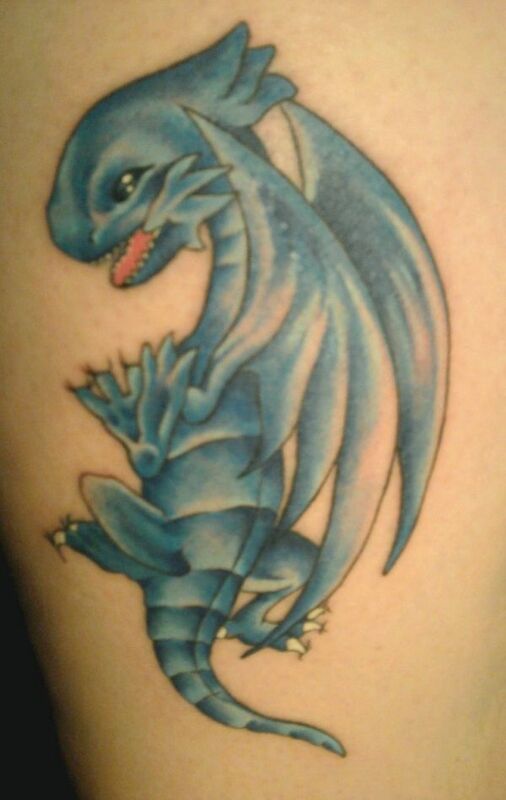 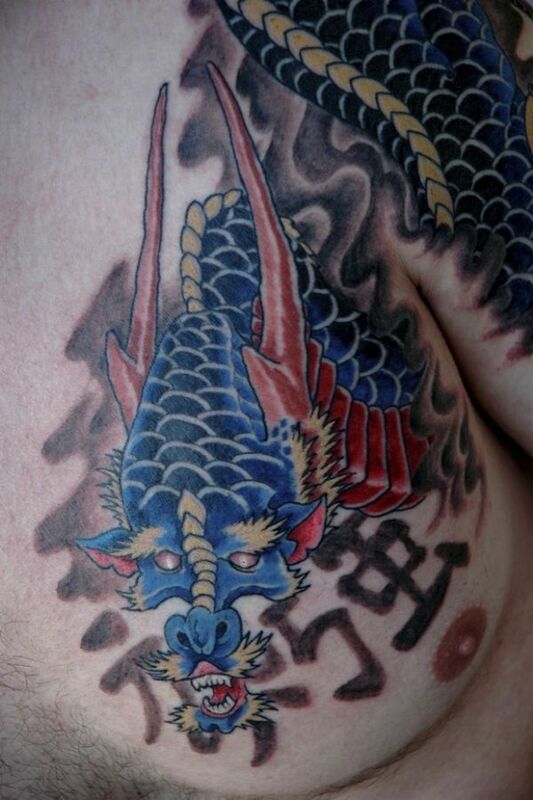 The tattoo features the monster card Blue-Eyes White Dragon. 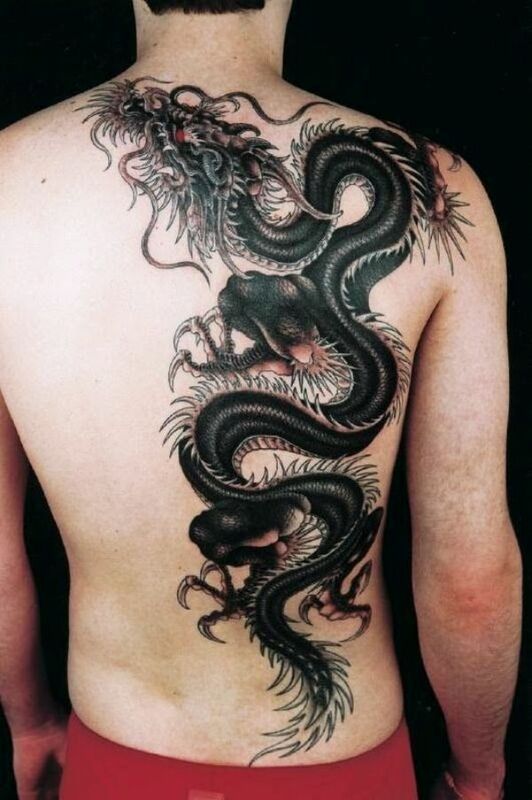 The dragon strikes a threatening pose — curling its length on your back. 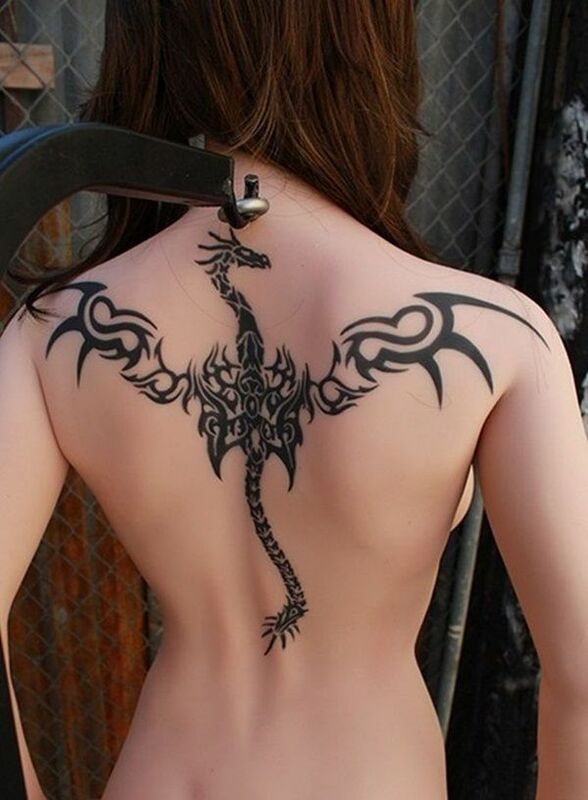 The menacing dragon head grants you a charm of strength and power that cannot be hidden by clothes. 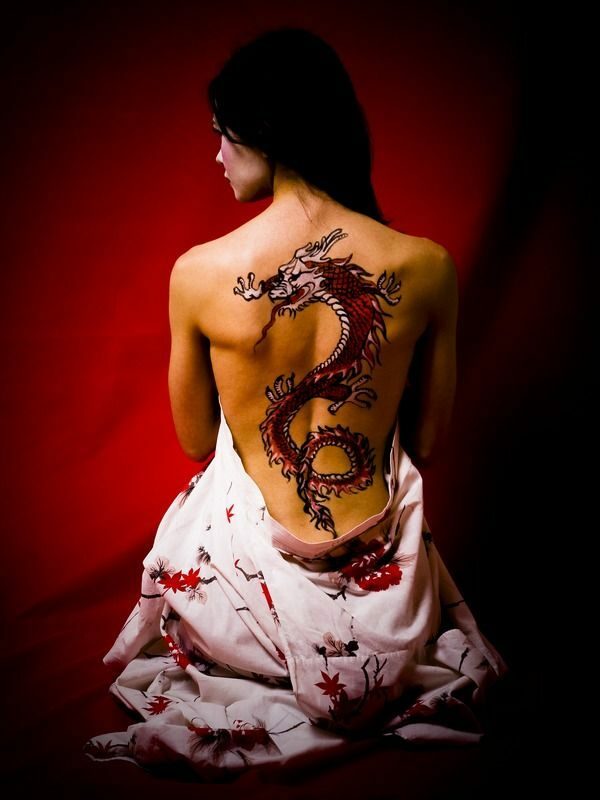 The mighty dragon carries with it a powerful oriental aura that wraps your back up to your arm. 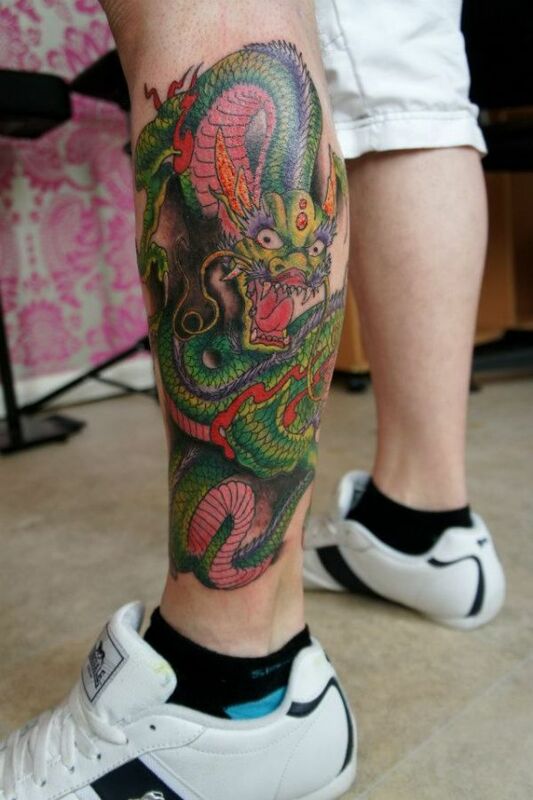 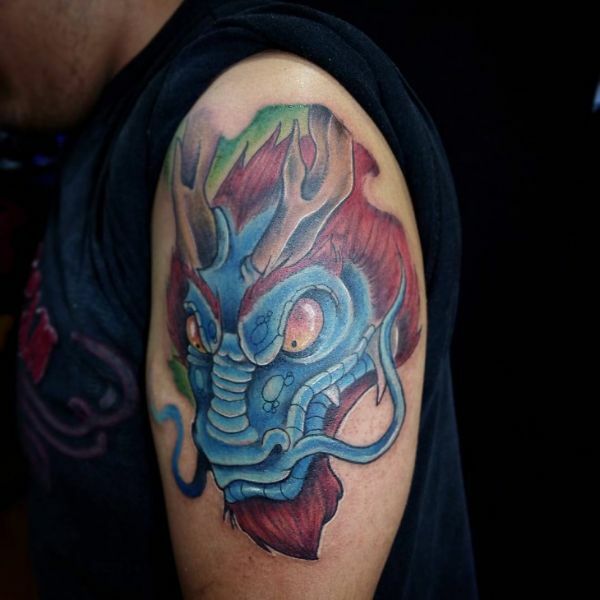 This dragon tattoo is inspired by the award-winning Japanese animated movie Spirited Away. 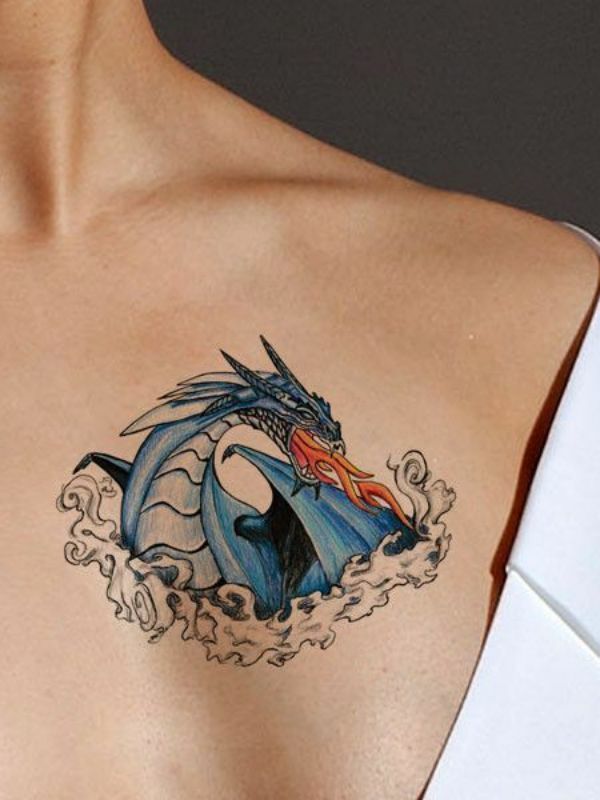 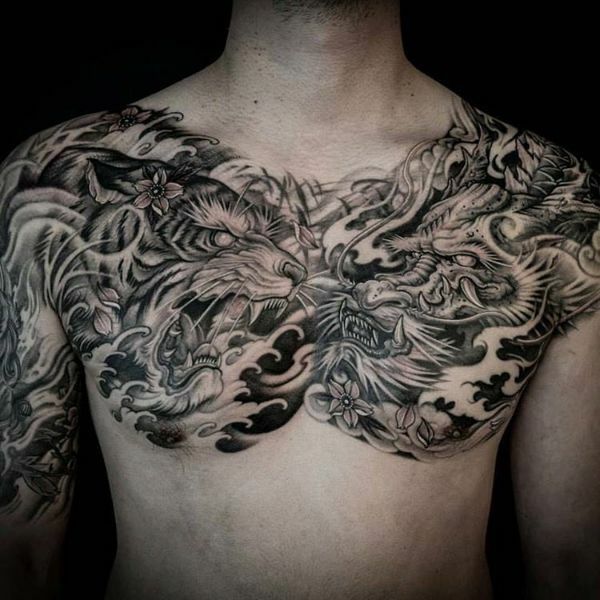 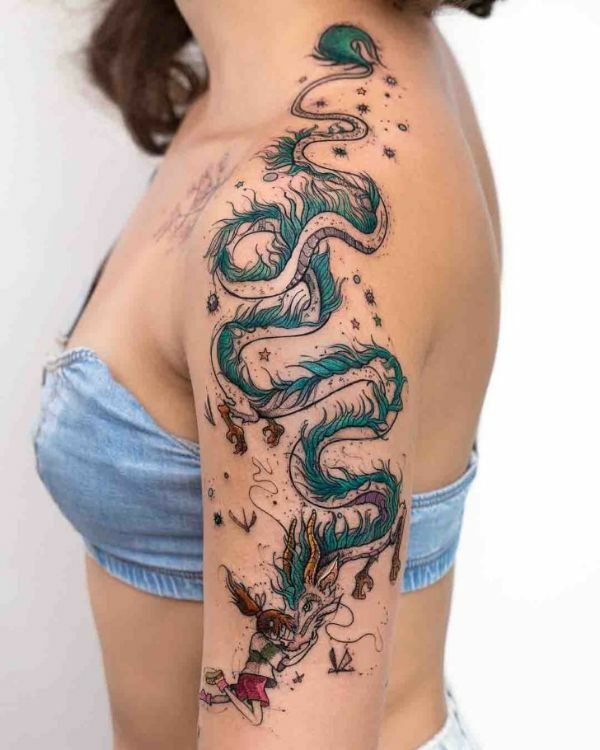 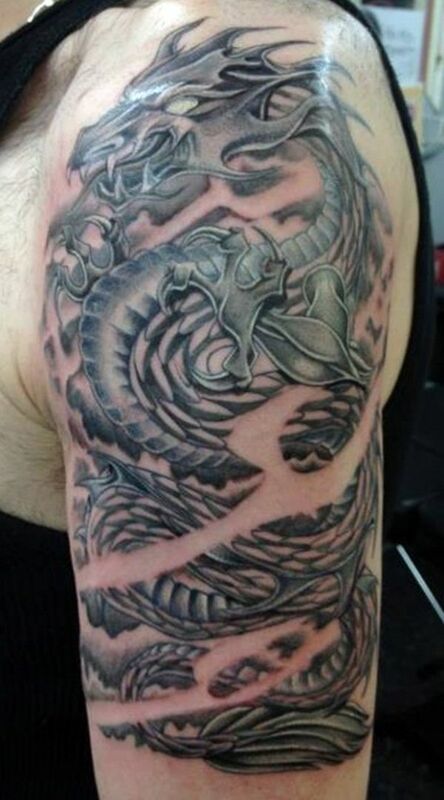 The tattoo features the protagonists Chihiro Ogino and Haku, the river spirit in dragon form. 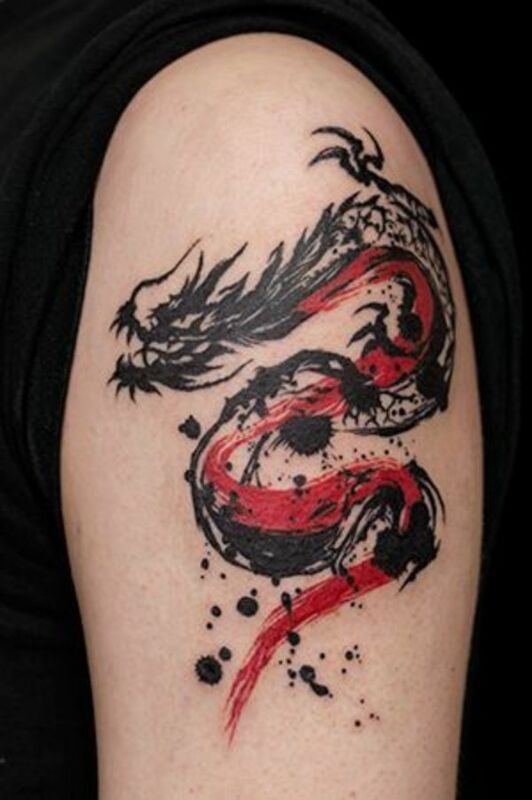 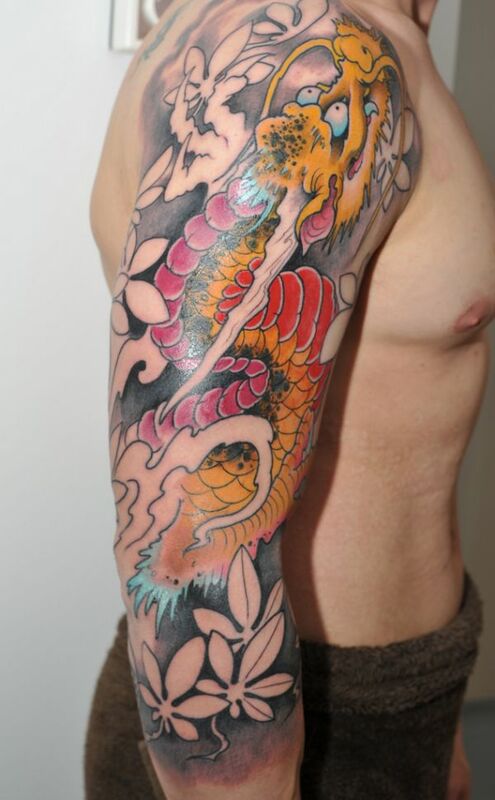 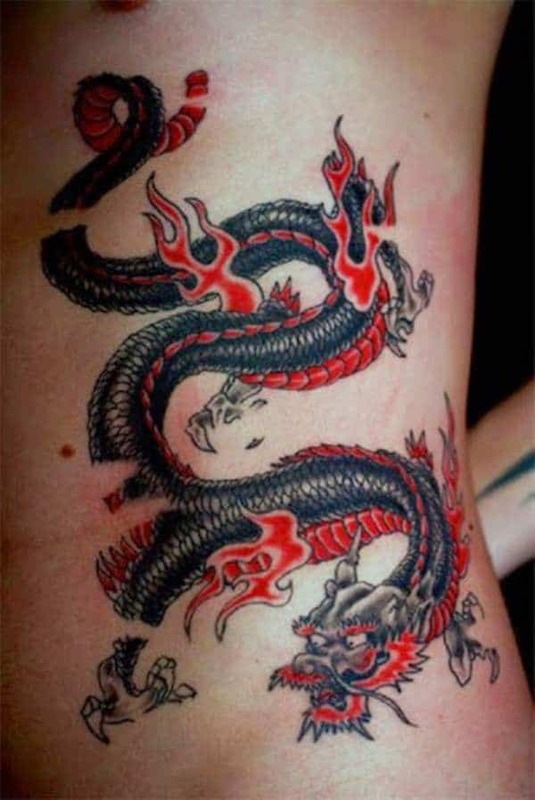 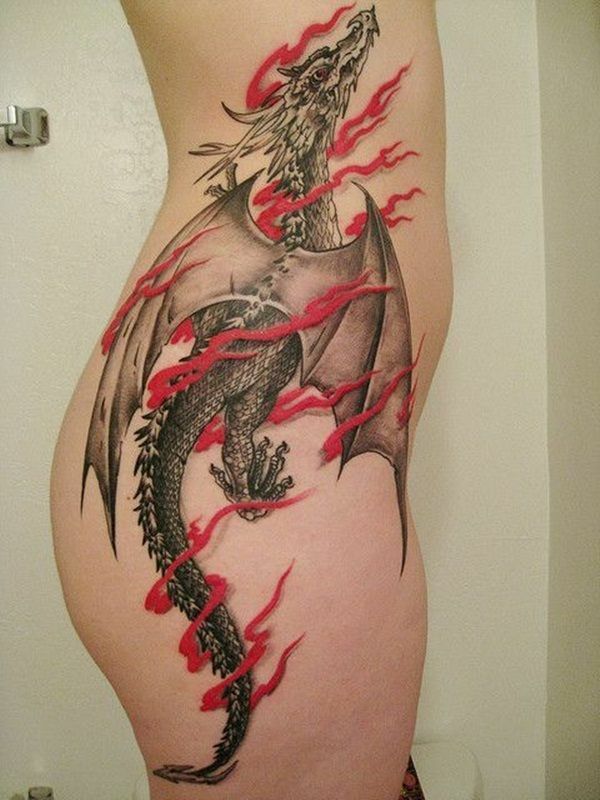 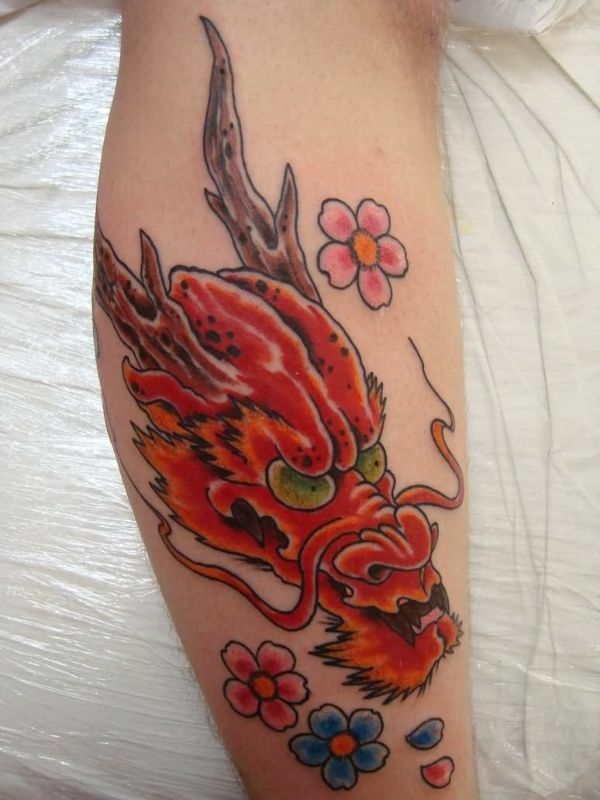 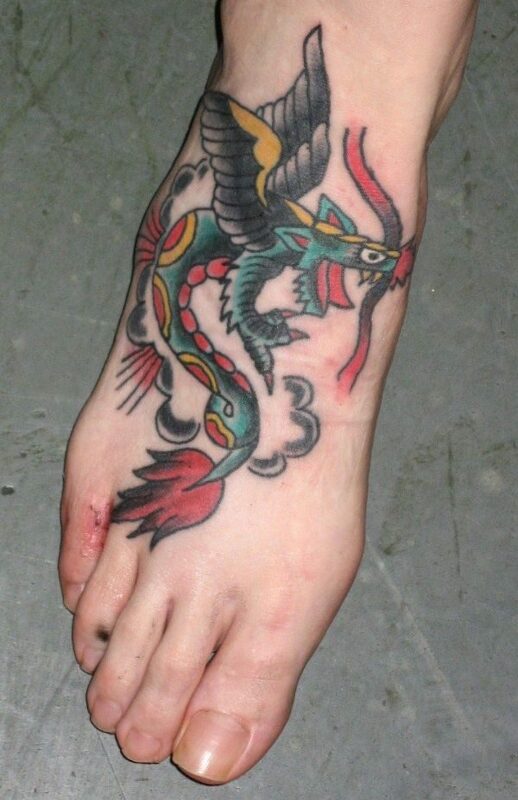 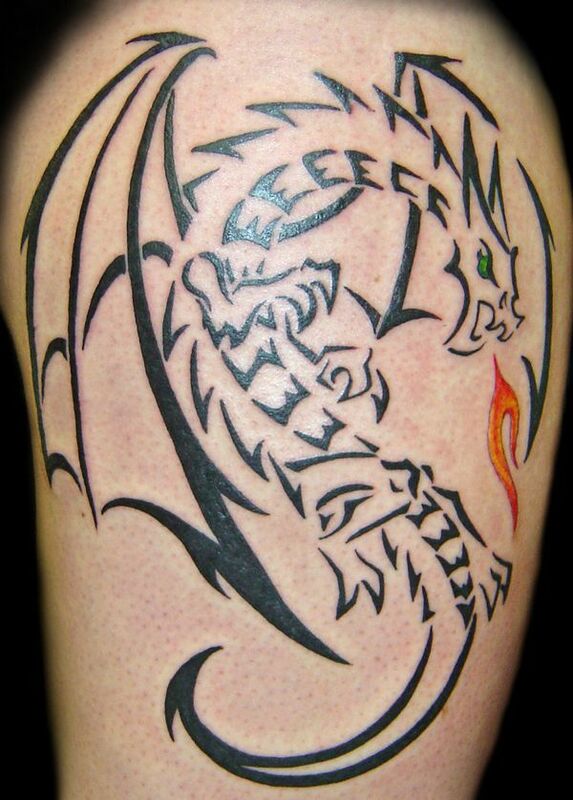 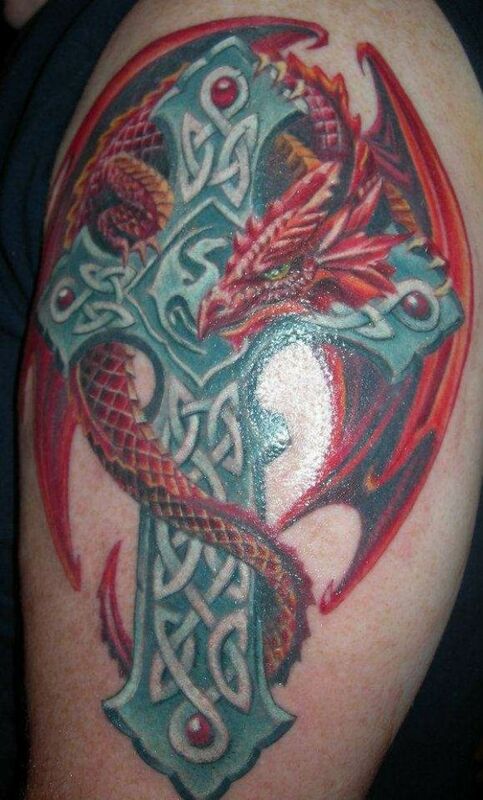 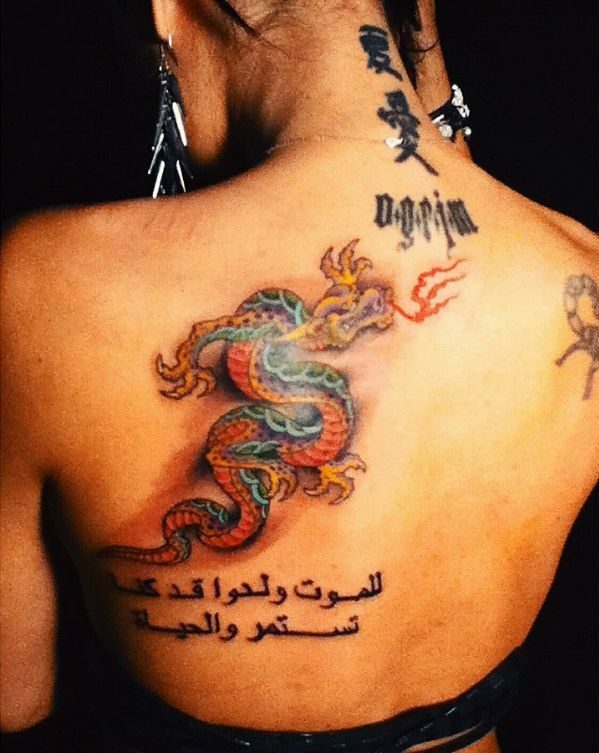 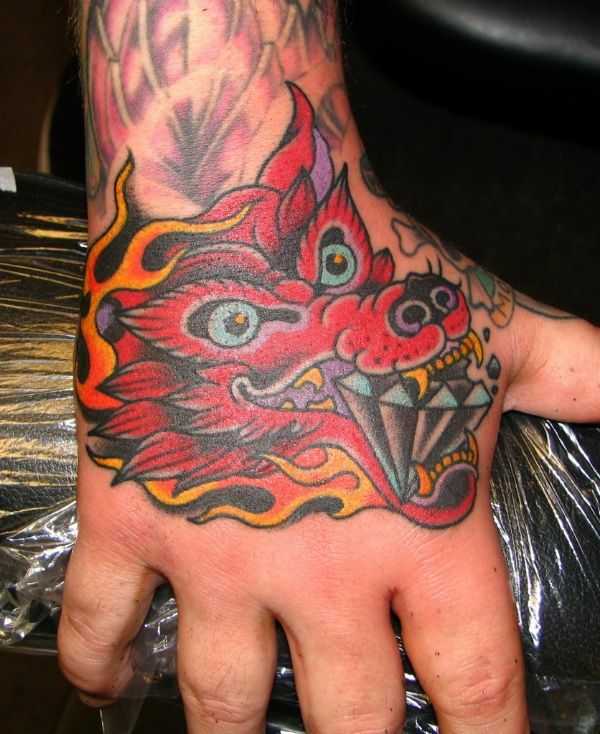 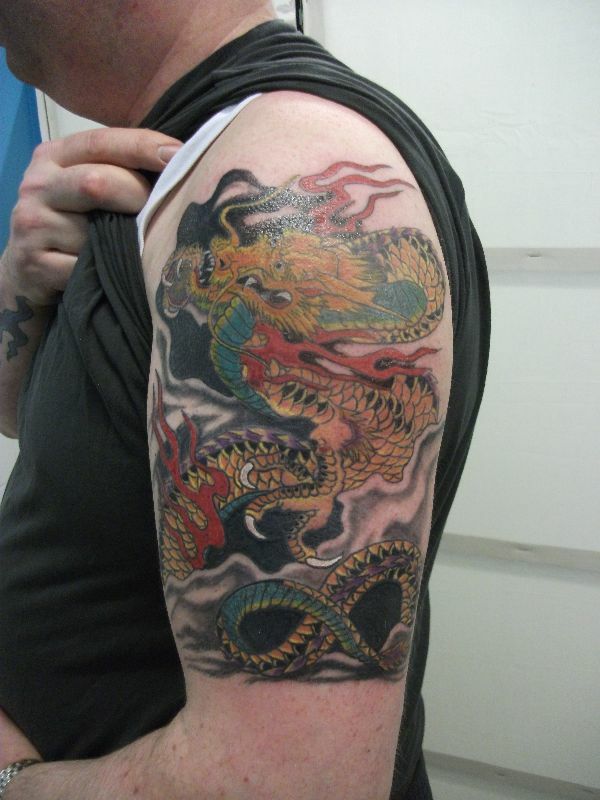 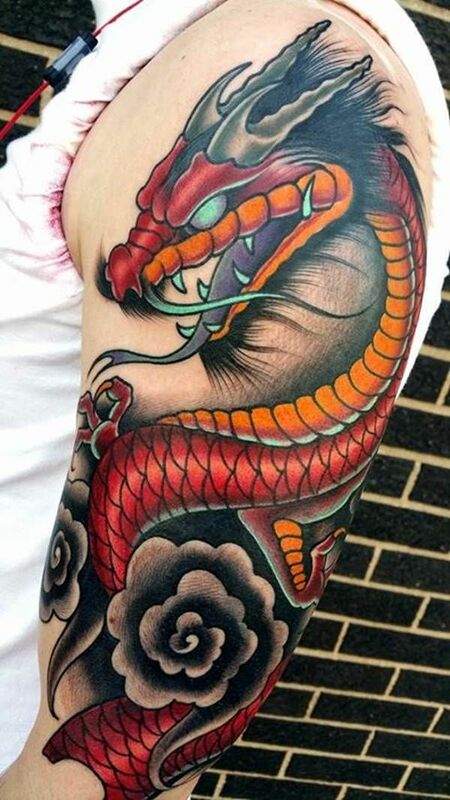 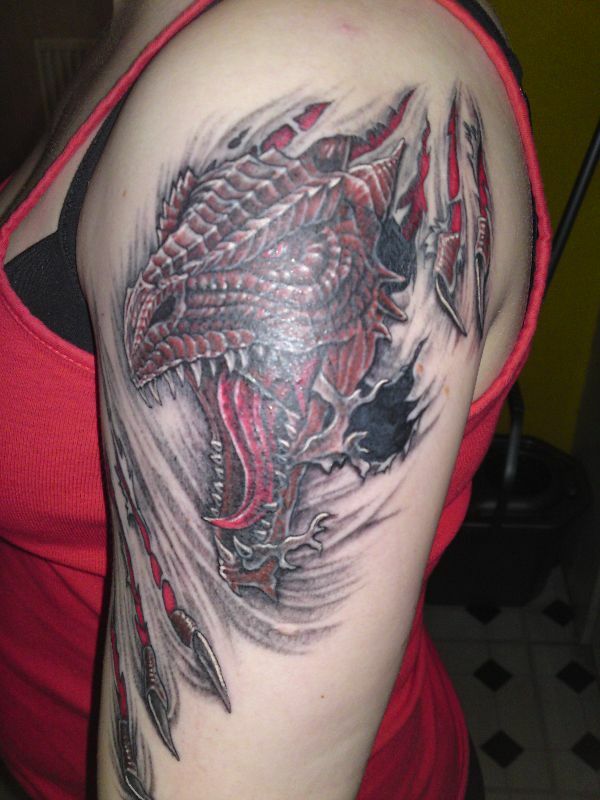 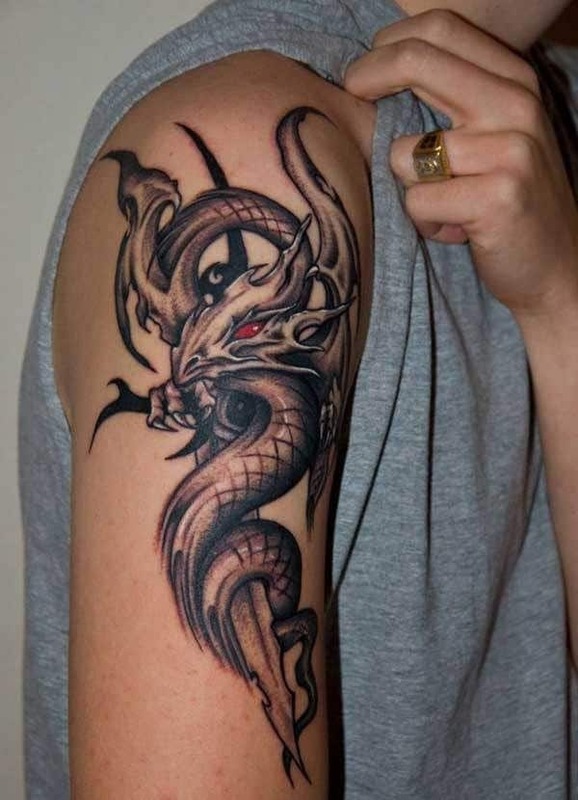 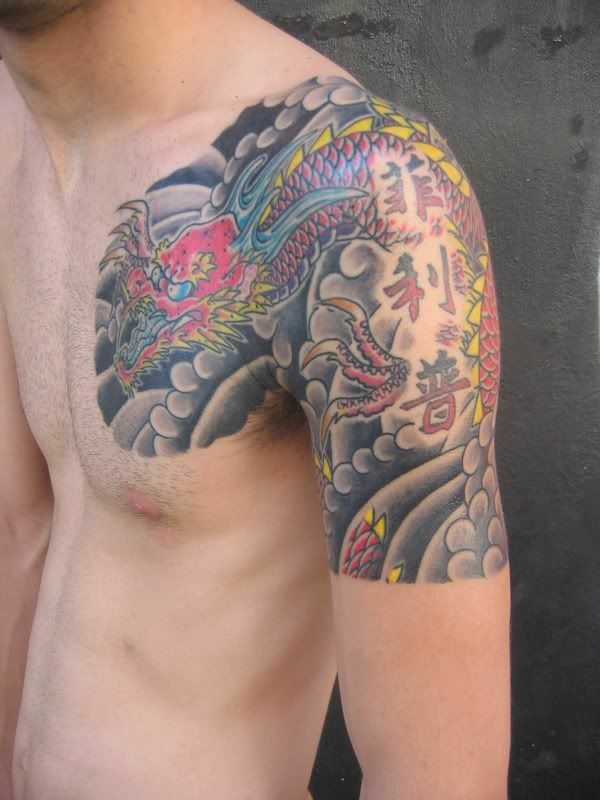 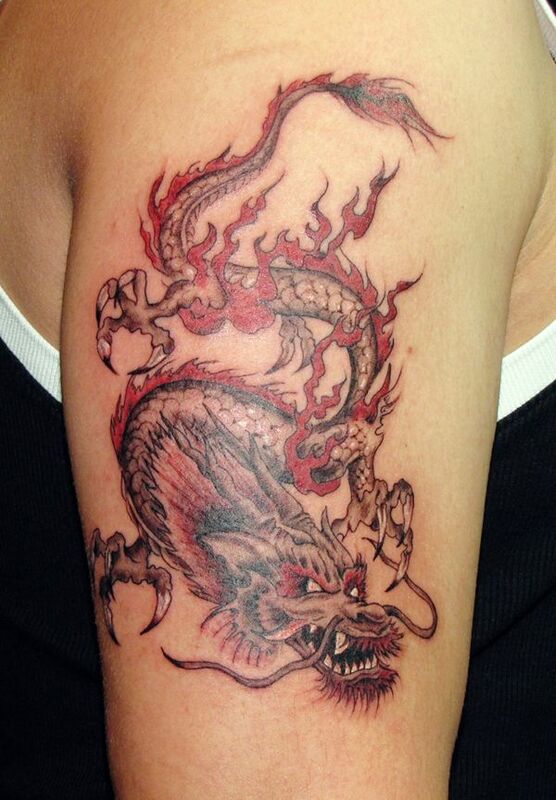 The red and black motif of this dragon tattoo gives a very oriental feel to it. 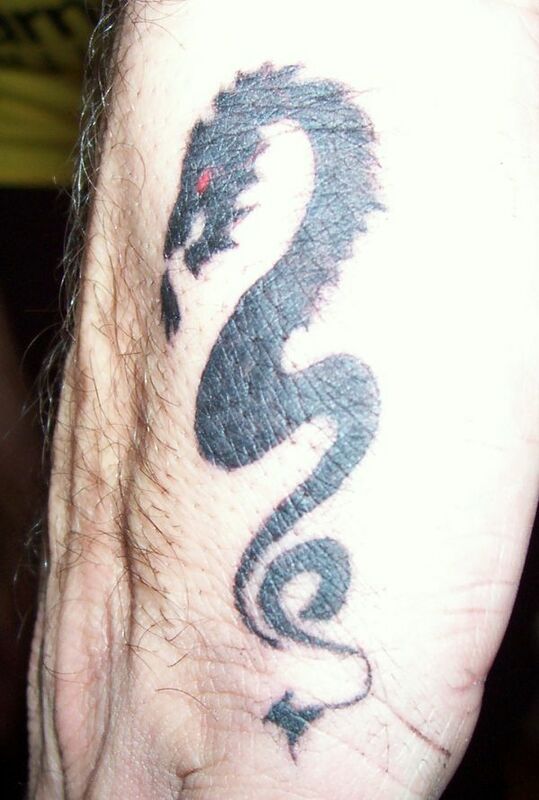 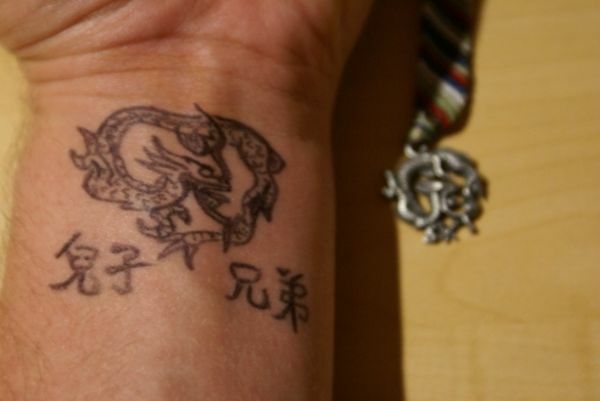 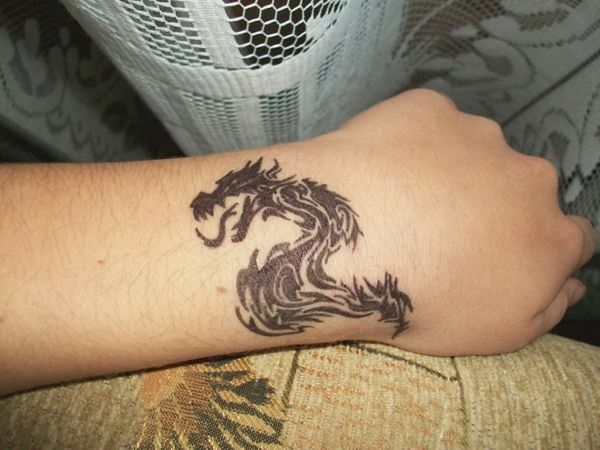 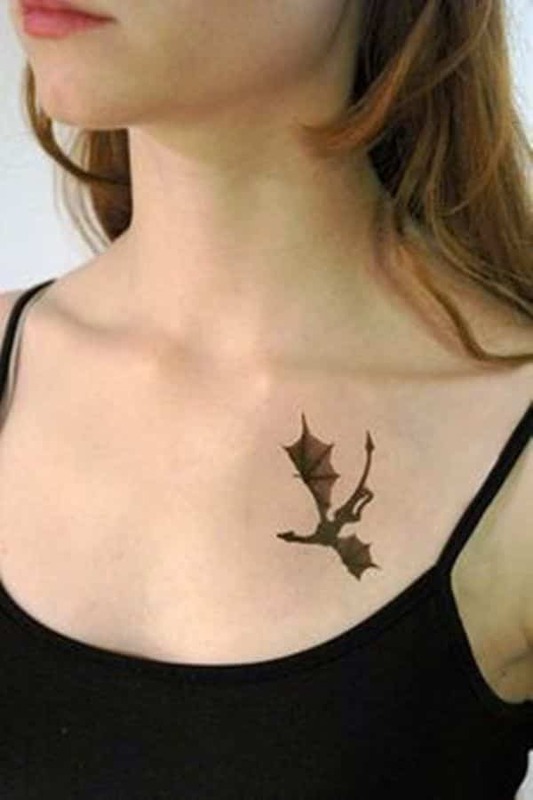 The small dragon tattoo on the wrist is perfect for those who want a subtle yet impacting ink. 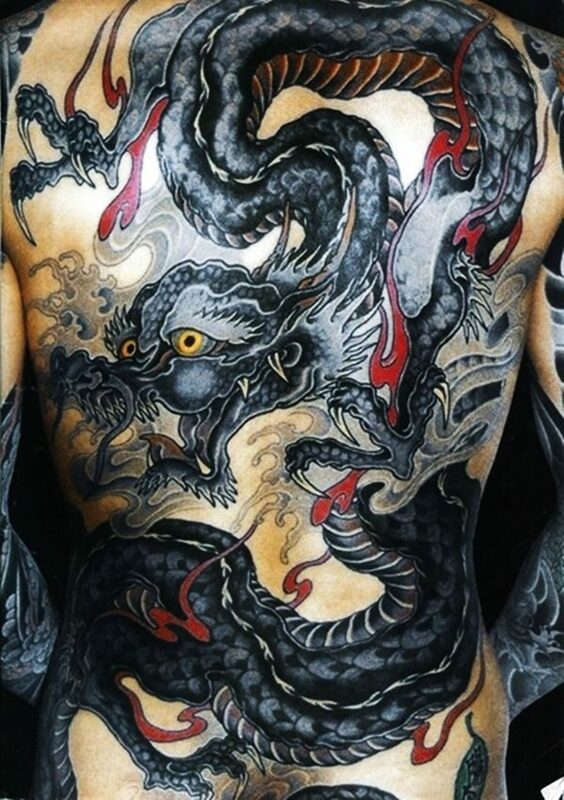 This dragon tattoo is a reflection of the traditional irezumi technique, a tattooing style popular in Japan before. 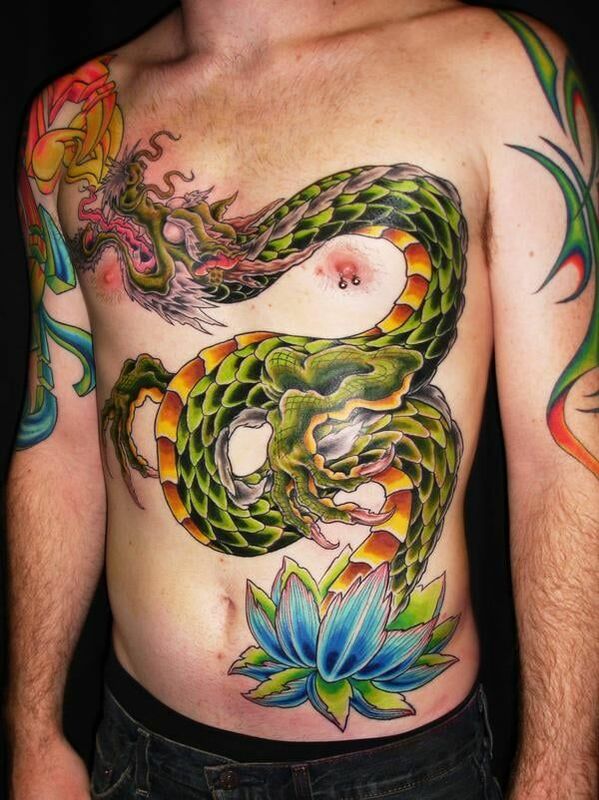 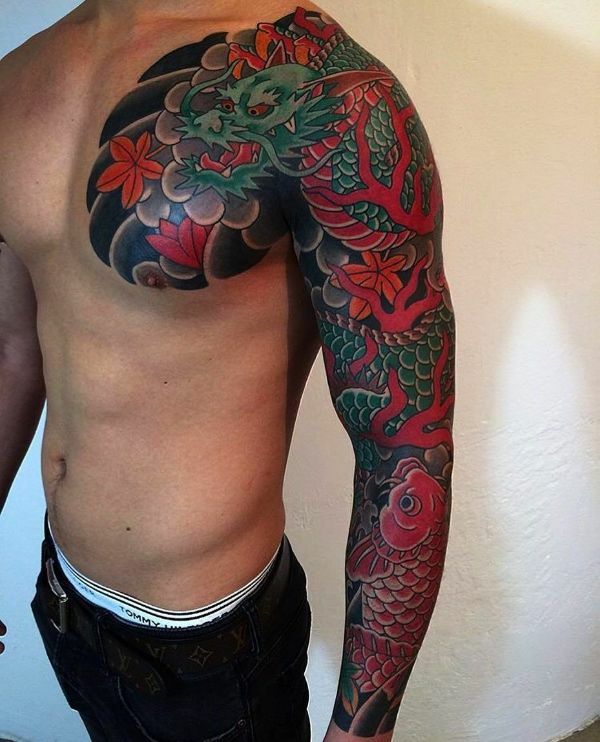 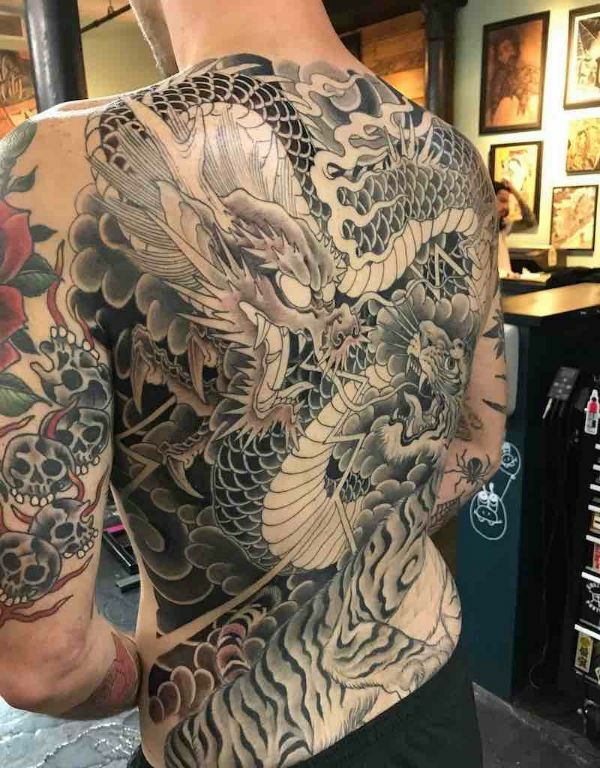 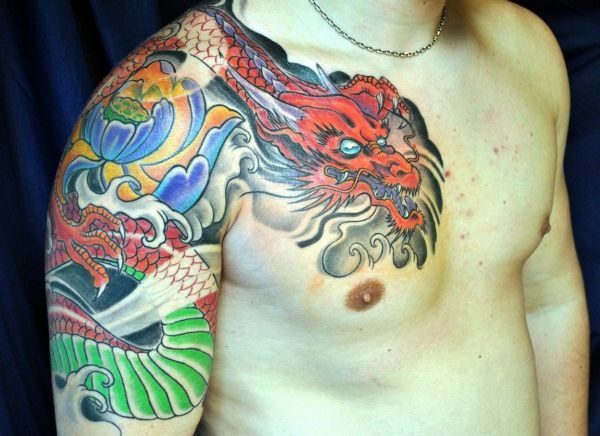 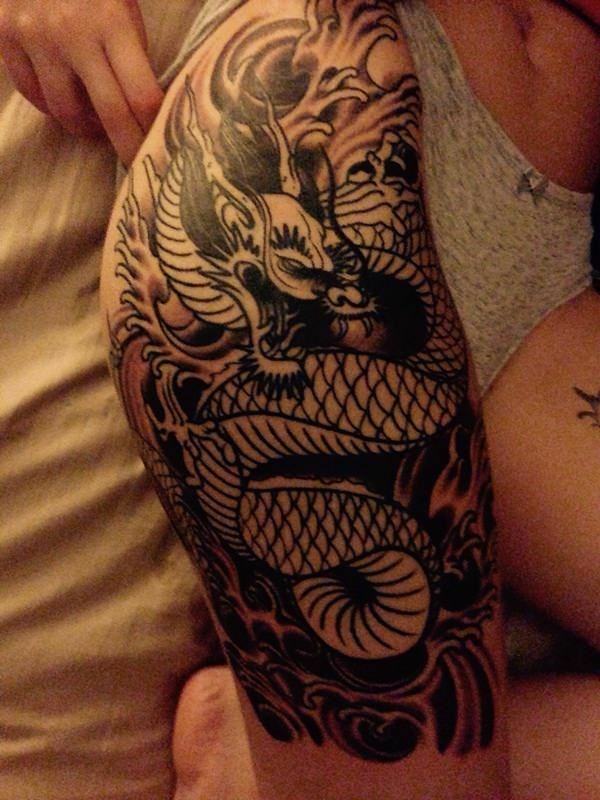 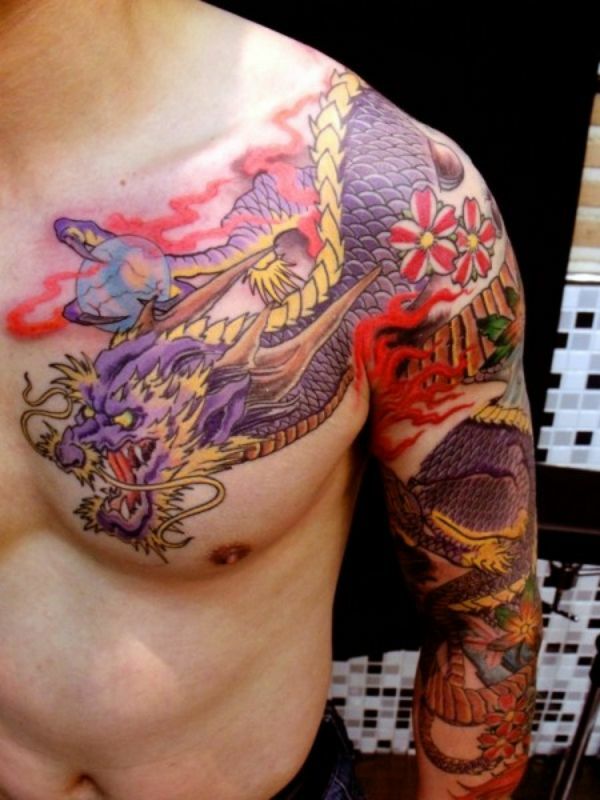 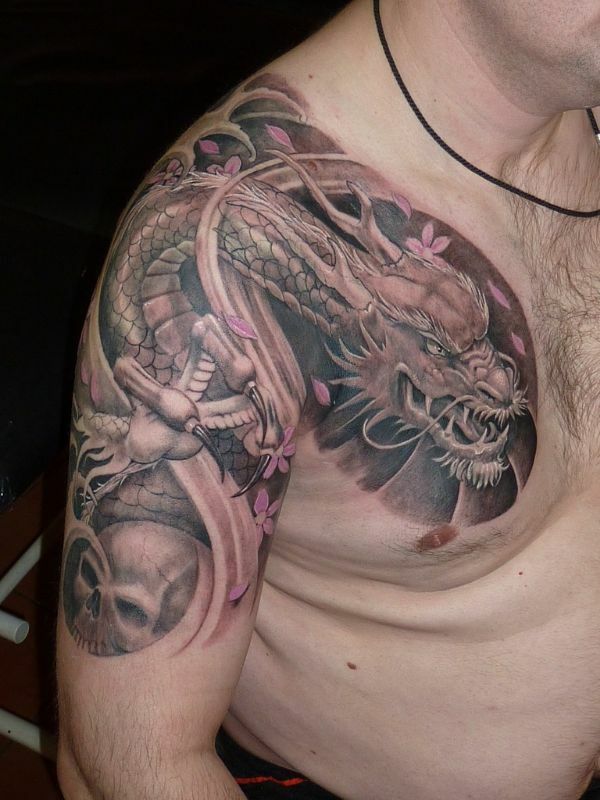 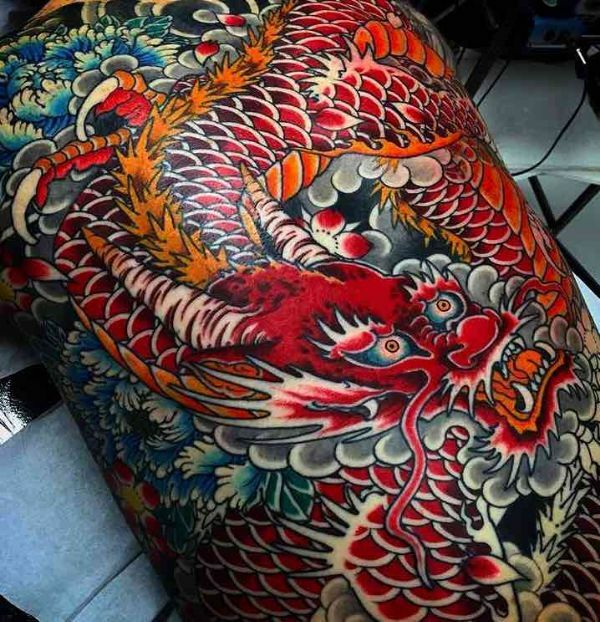 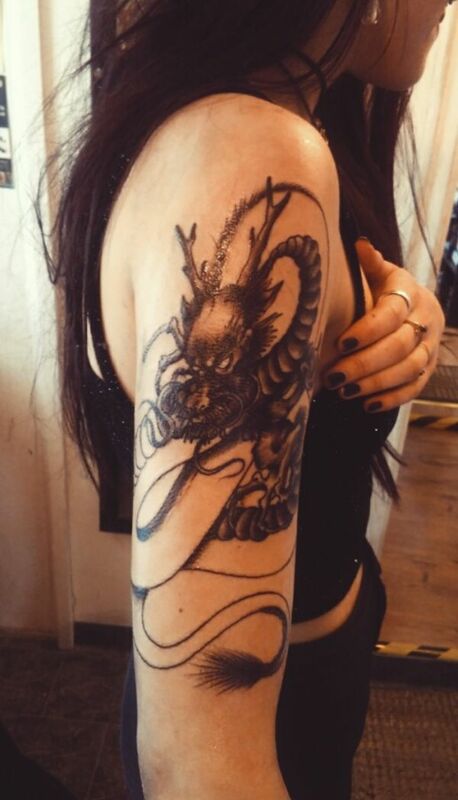 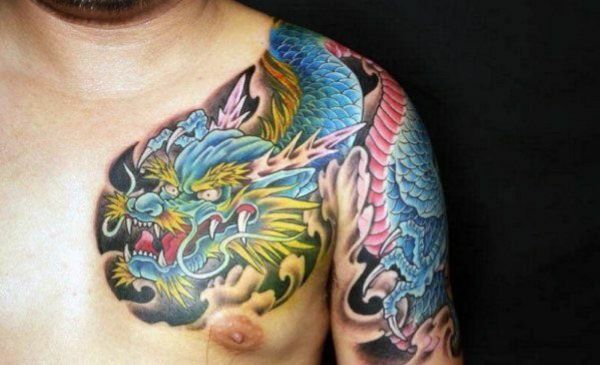 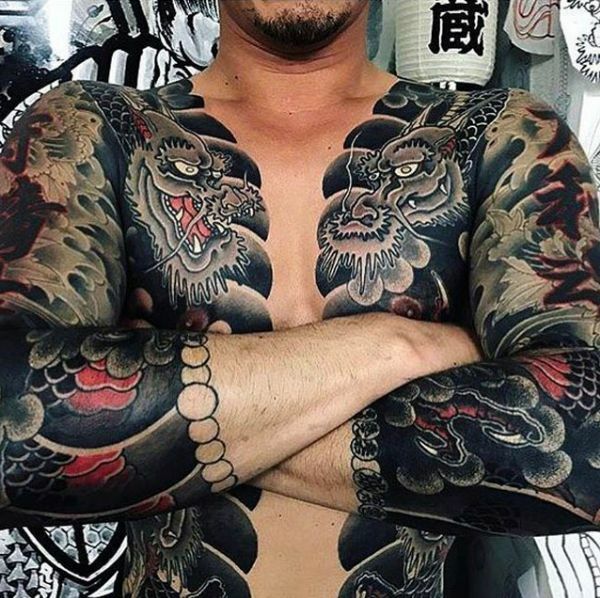 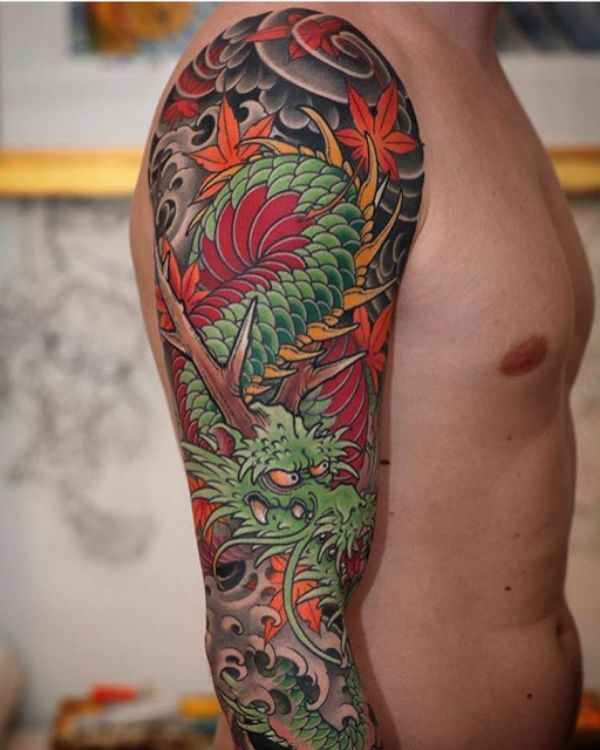 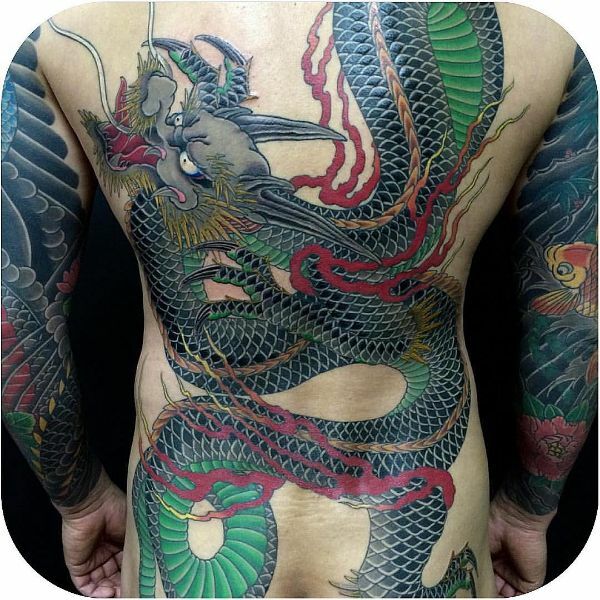 Embrace the Japanese irezumi technique with this full body tattoo of the noble Japanese dragon. 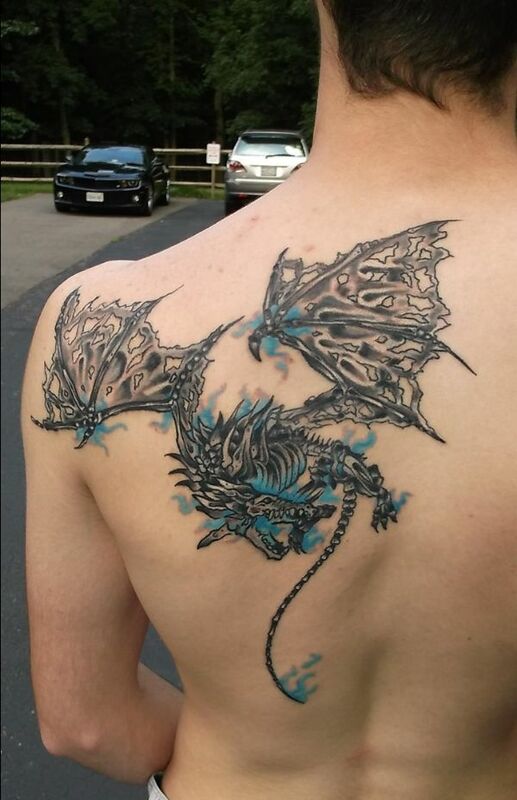 This tattoo makes you feel like the Lich Dragon: cold, ruthless, and blue. 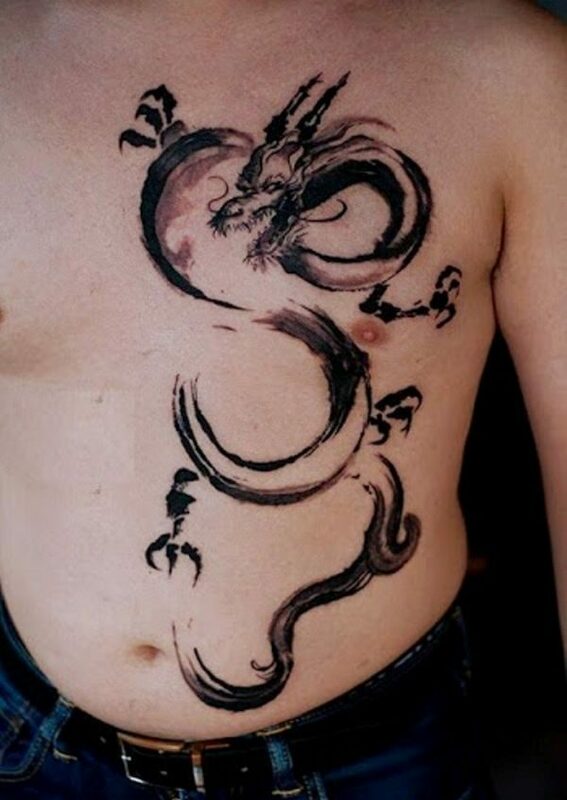 The small dragon flying across the chest represents the freedom that you have. 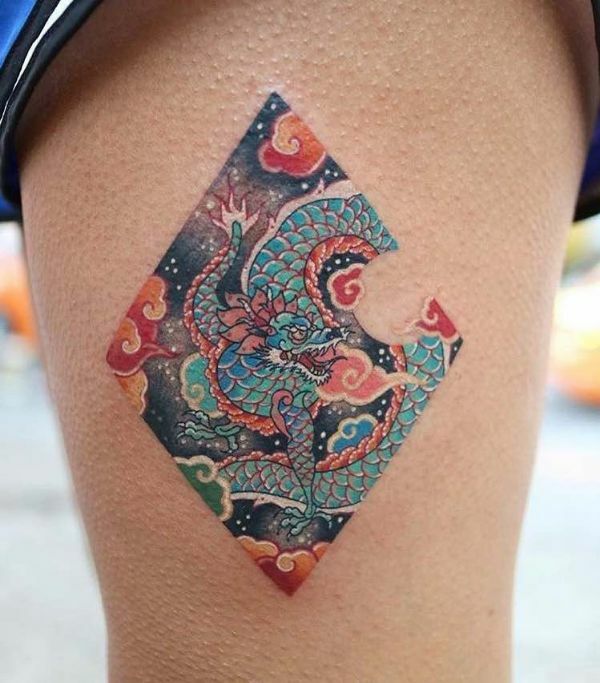 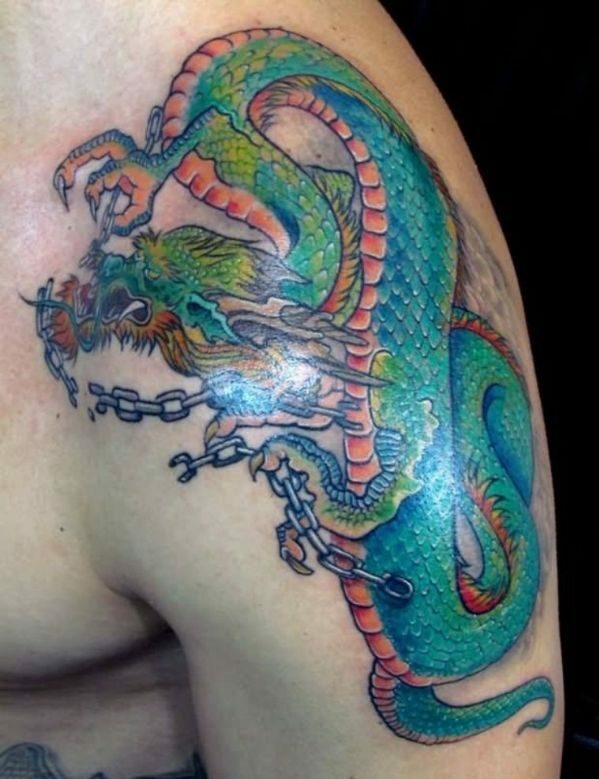 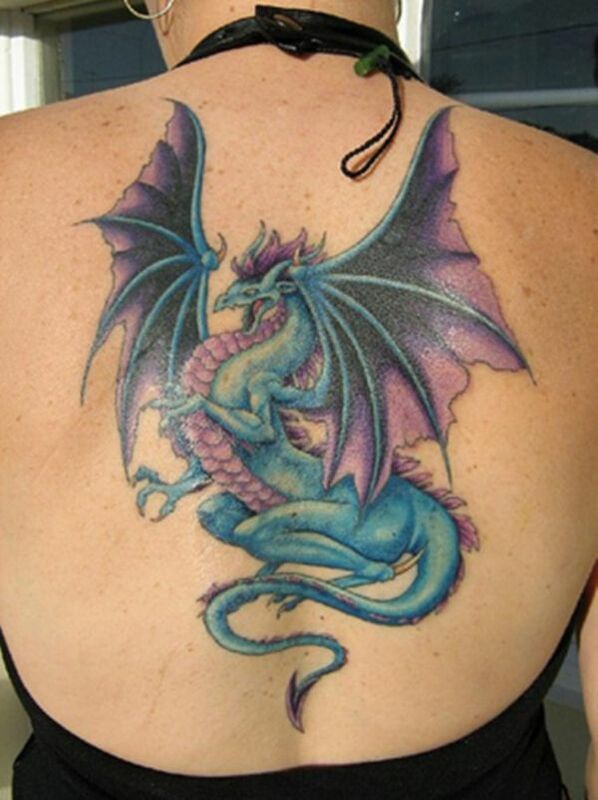 This is the subtlest dragon tattoo you can get, but it’s flashy enough with a cavalcade of colors. 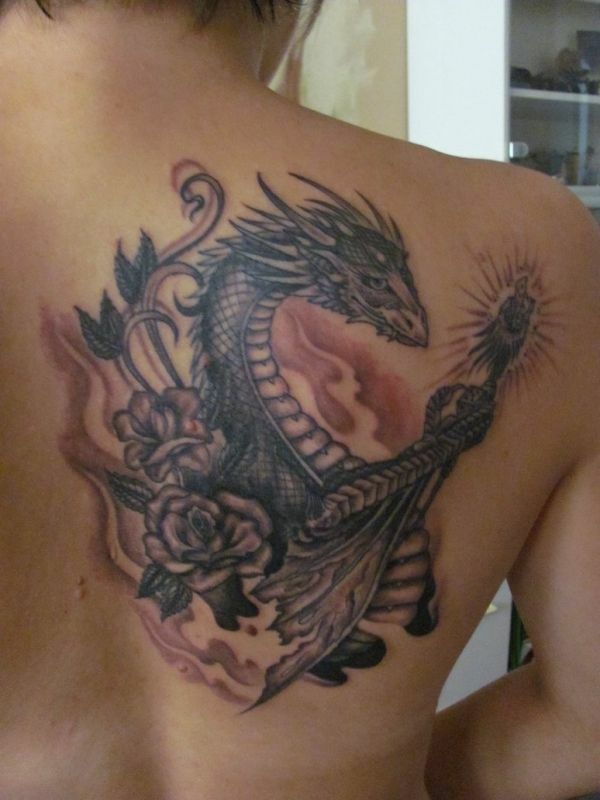 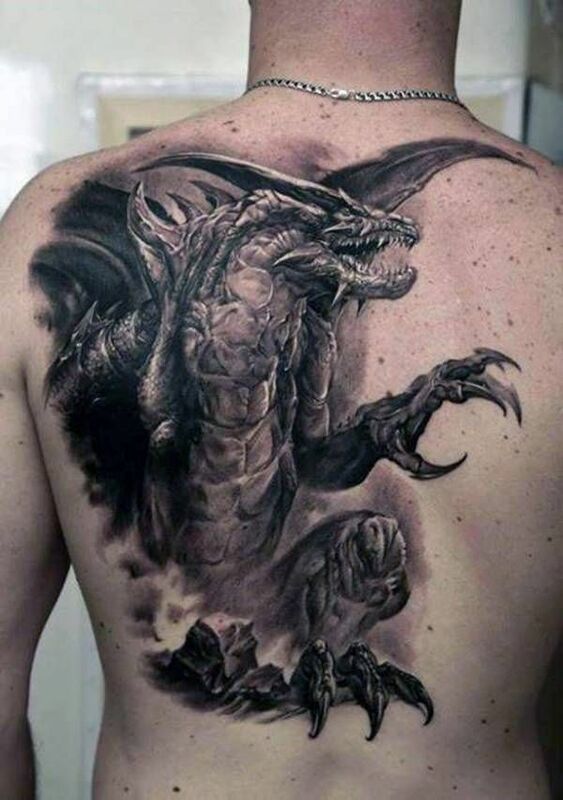 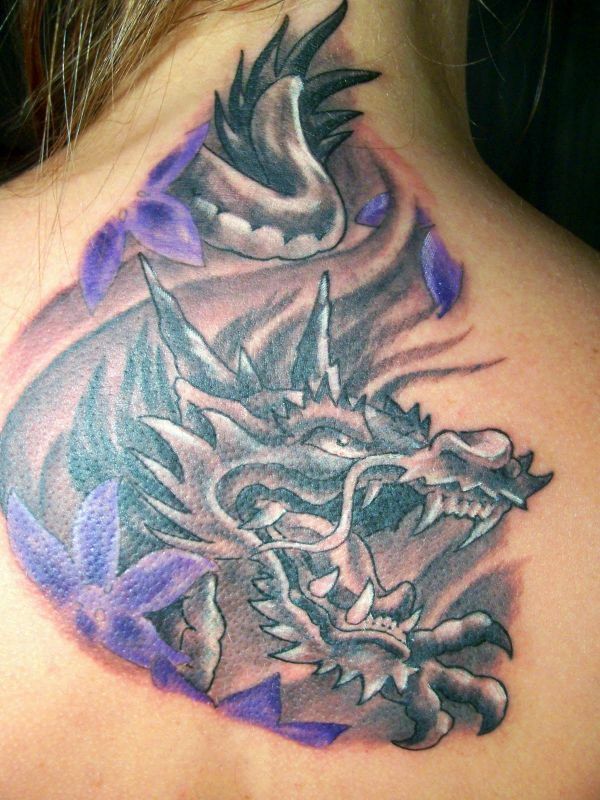 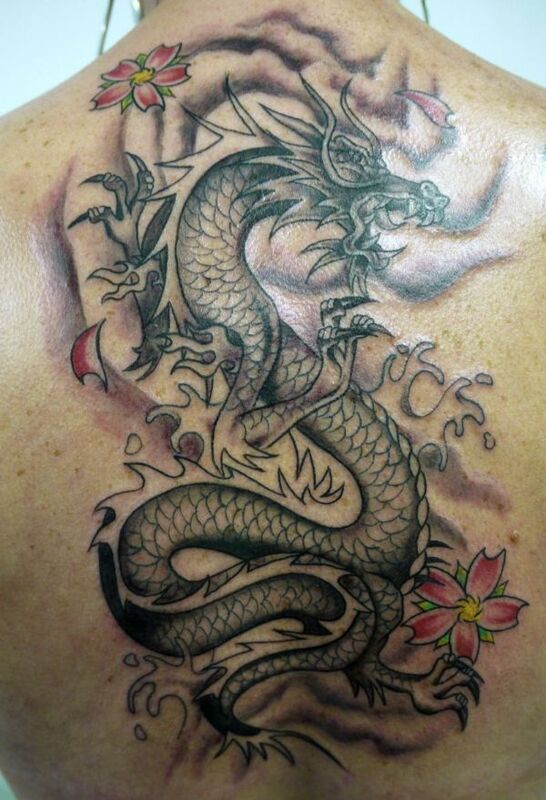 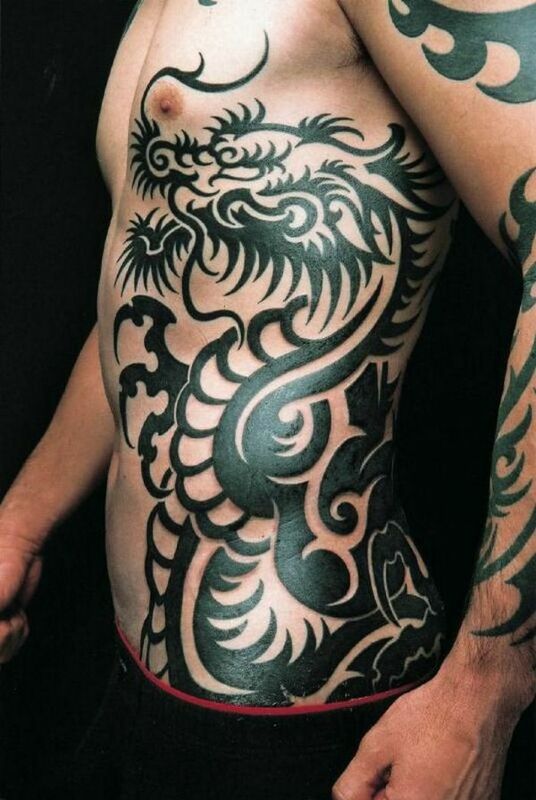 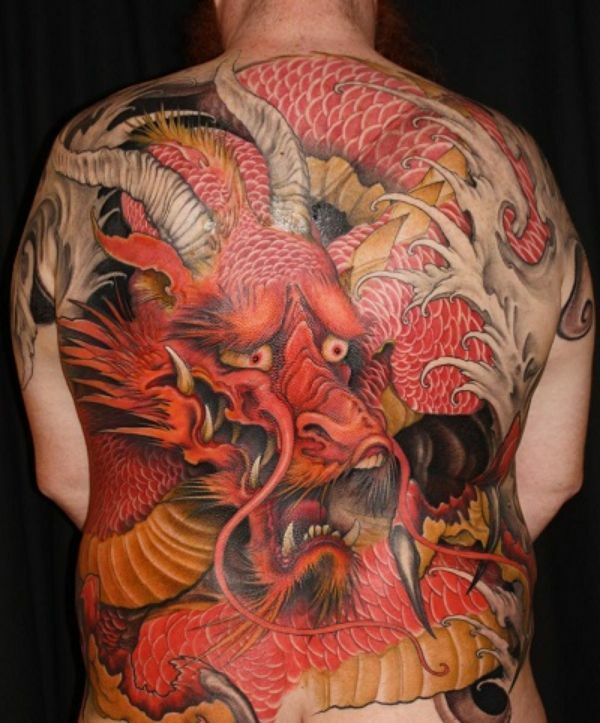 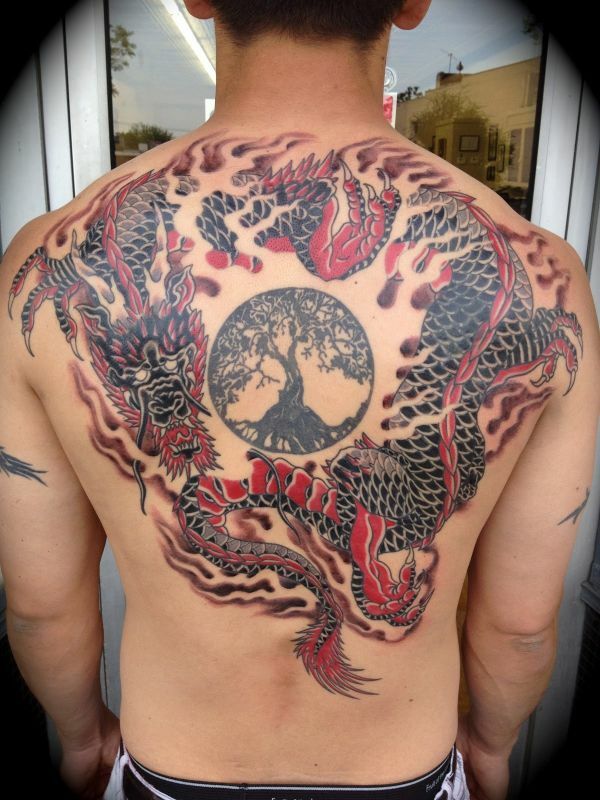 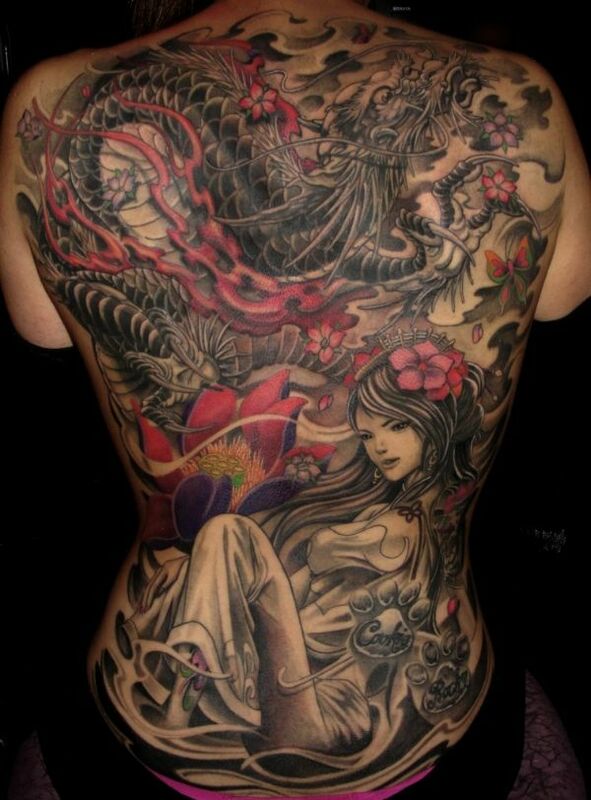 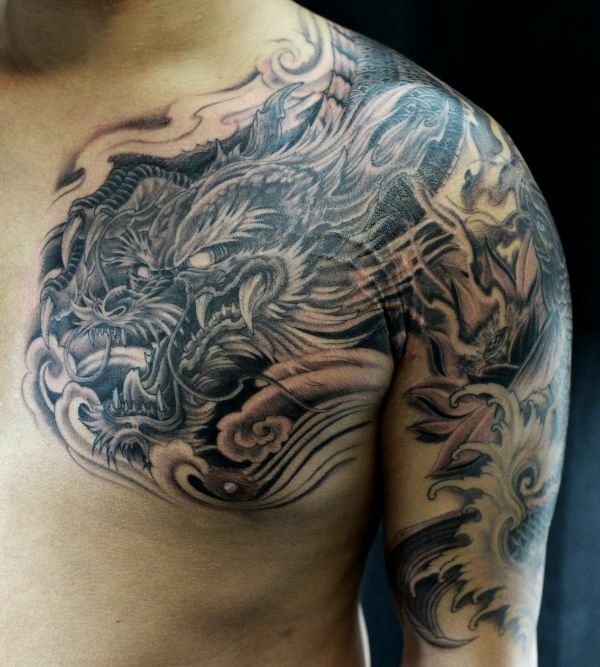 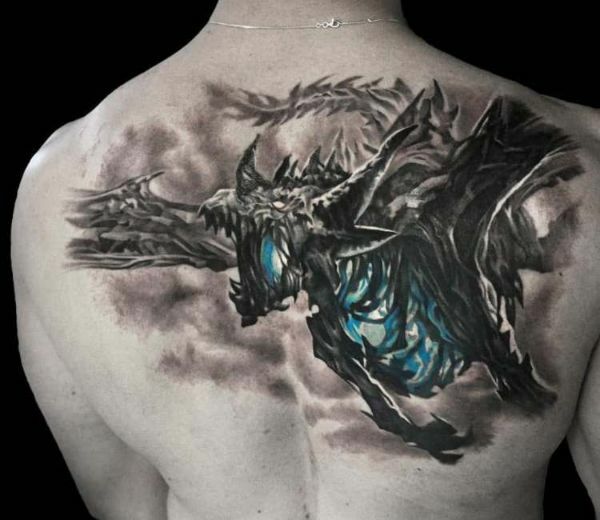 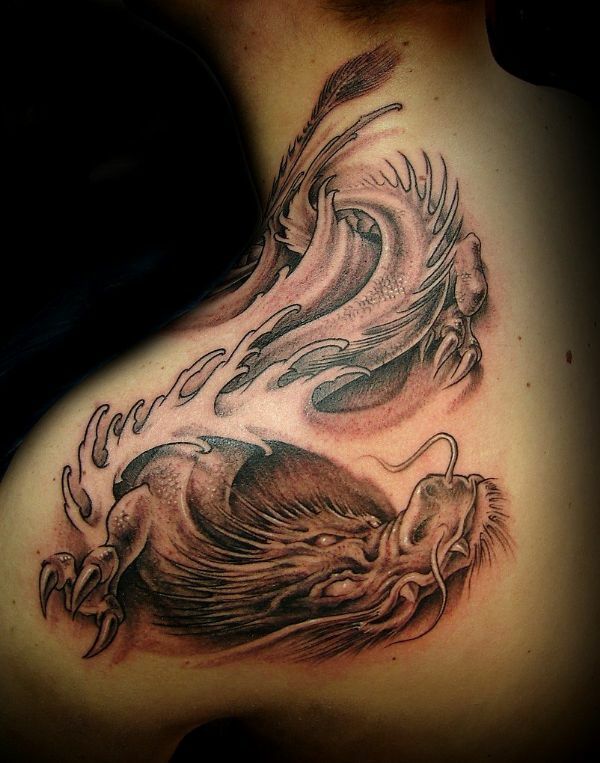 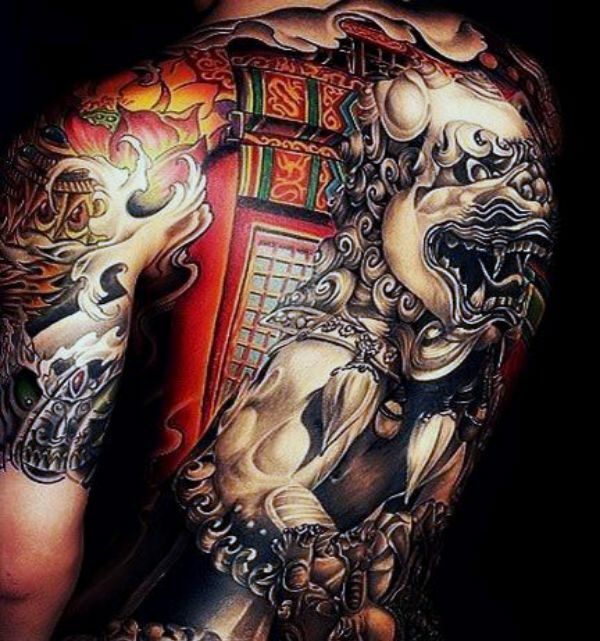 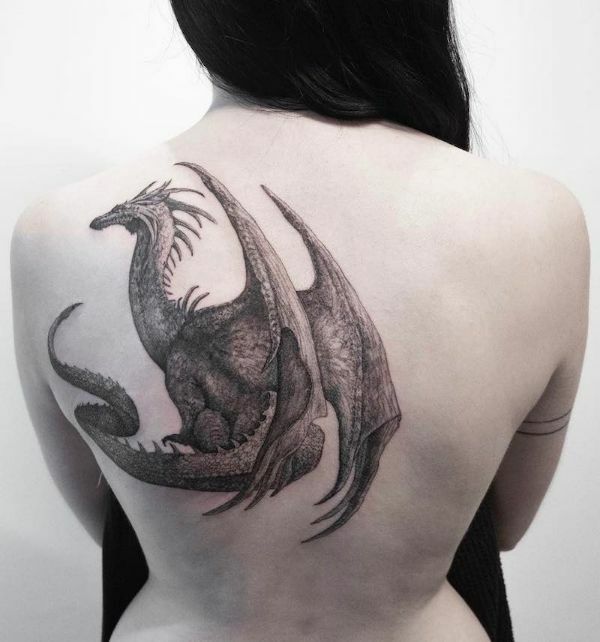 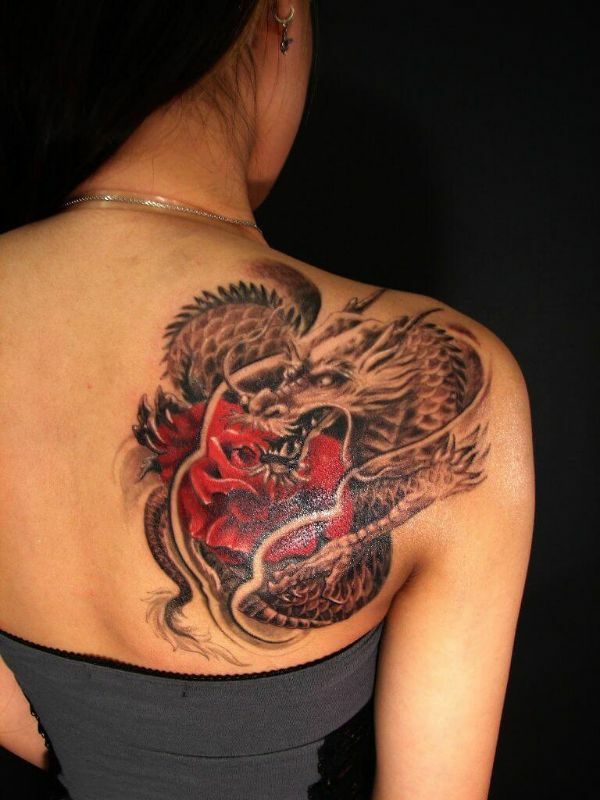 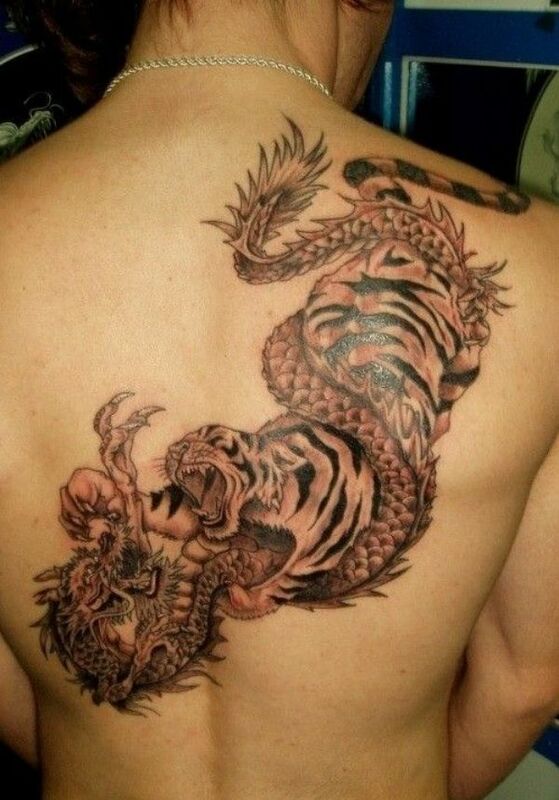 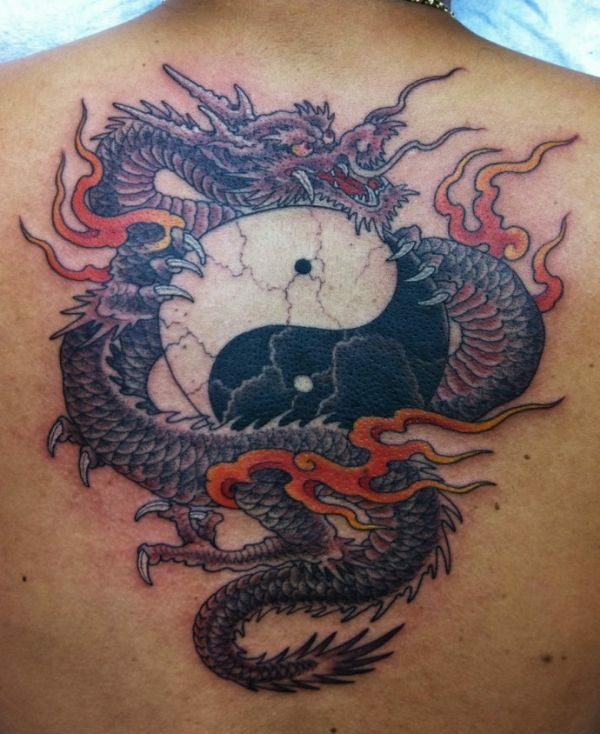 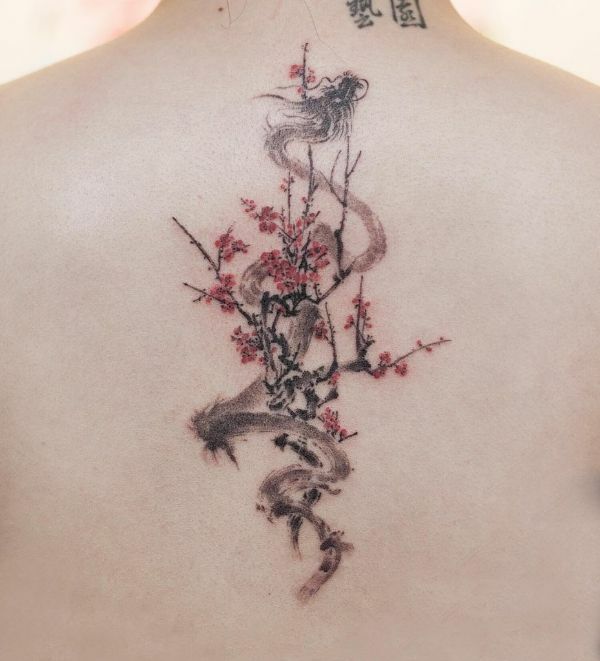 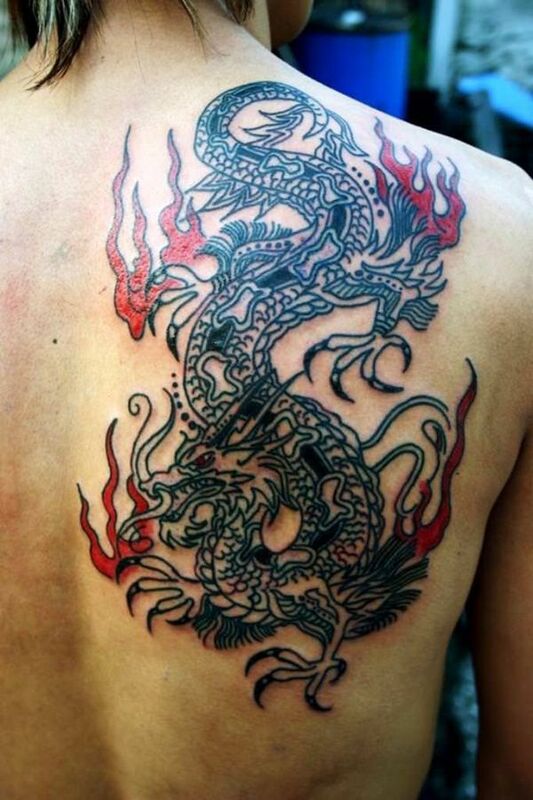 The monochrome palette of the tattoo evokes a melancholic aura from the lone dragon on your back. 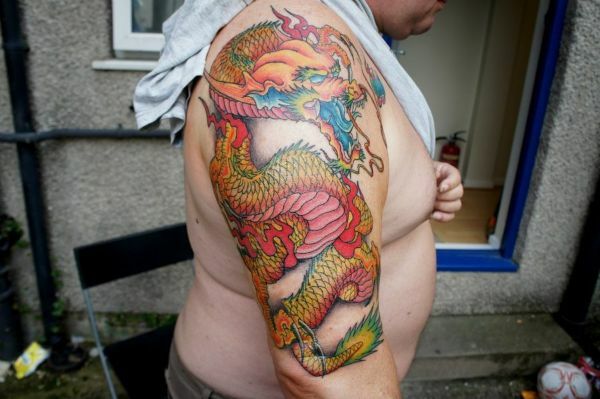 The yellow dragon is a supreme being, worthy to be flaunted on your front. 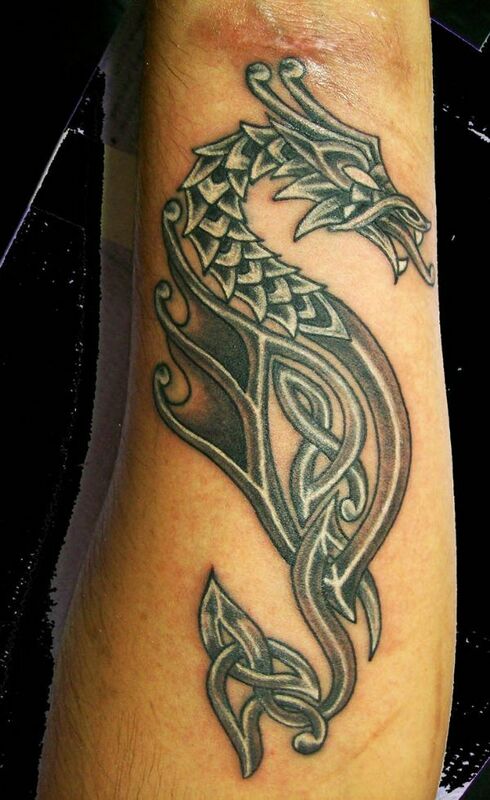 Feel the regality of the dragon soak into your leg, and walk with the confidence that the tattoo grants you. 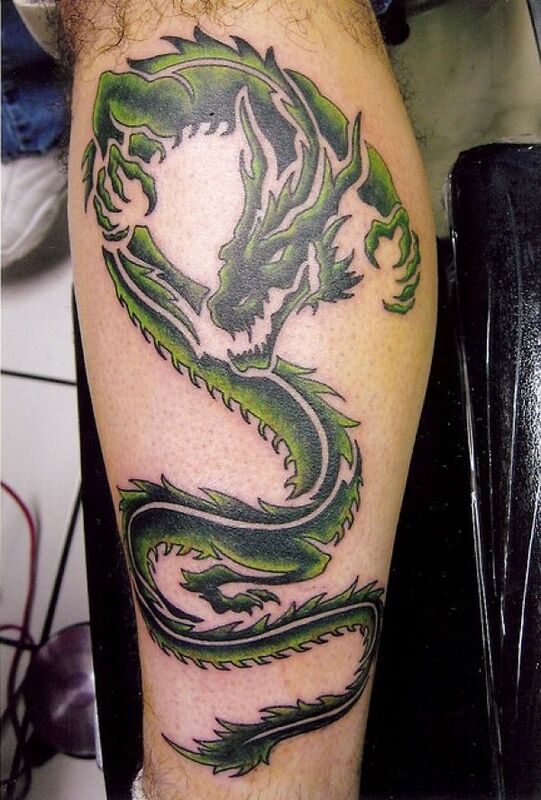 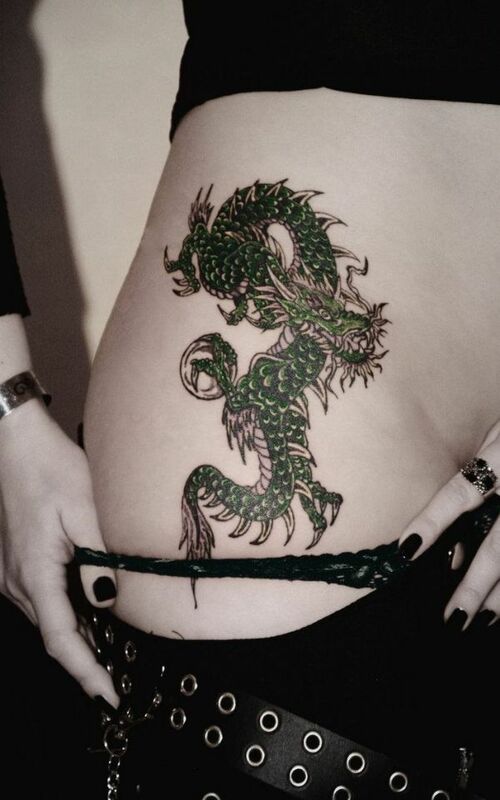 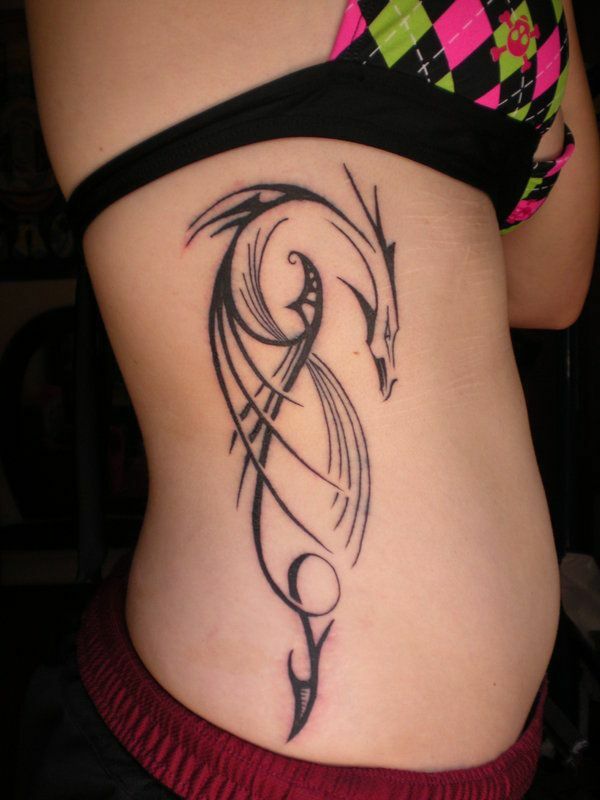 The green dragon on your hip has a charm of strength and sexiness that only dragon tattoos on women hips can pull off. 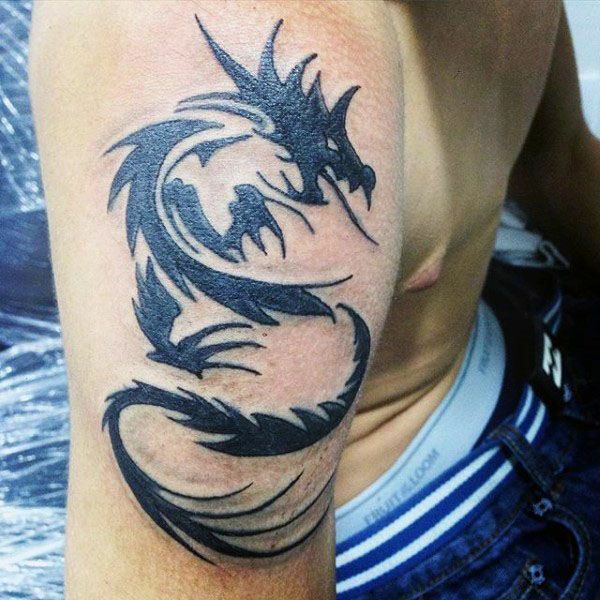 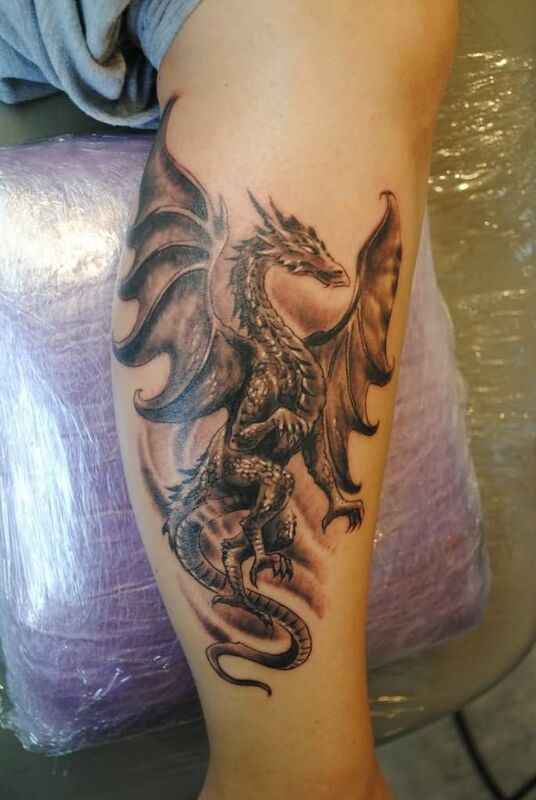 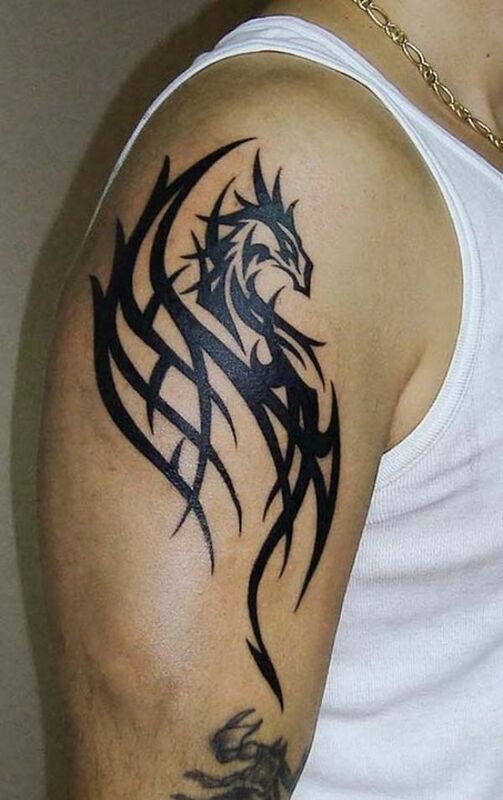 You can consider a dragon tattoo on the arm as a display of strength. 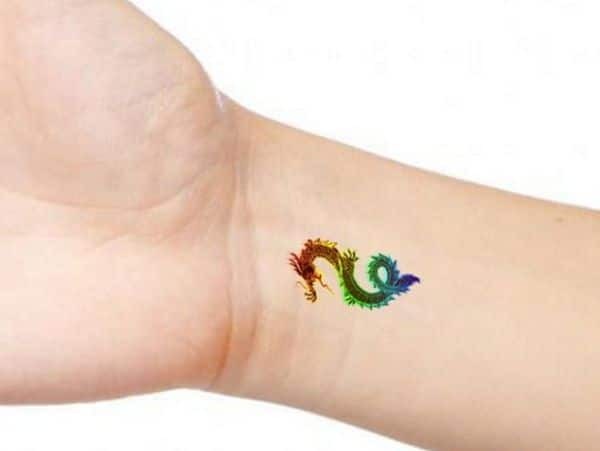 As a conspicuous body part and one we use in our daily tradings, inking a symbol of power on the arm shows the vigor we possess and let everyone know we have it at one glance. 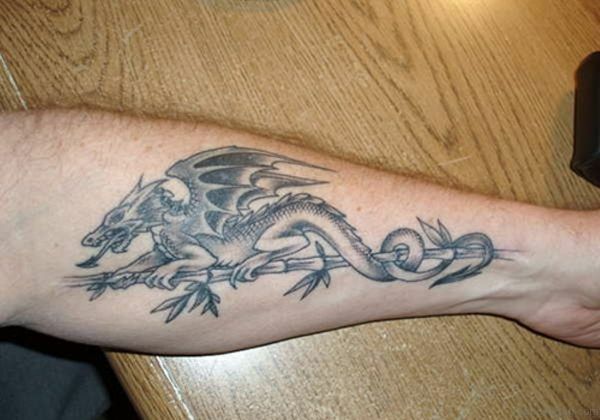 Wrap your dragon around your arm like a worn sleeve and maybe even let it spill to your shoulders and chest. 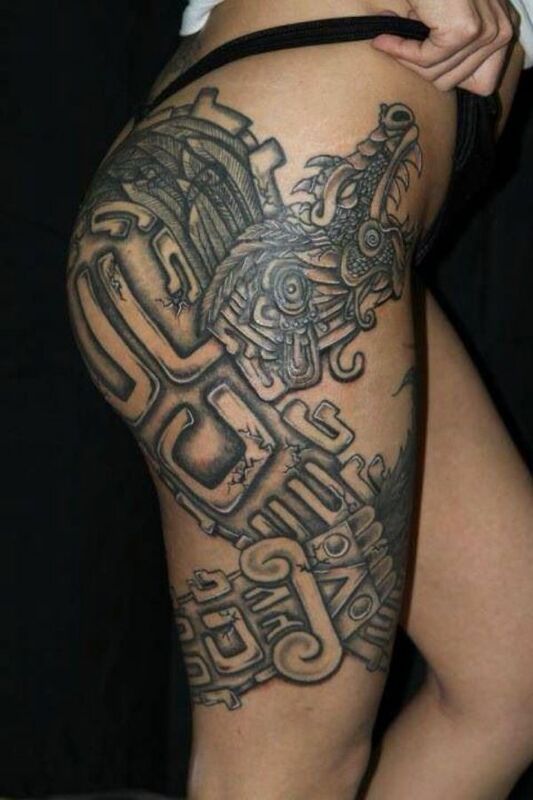 There is a particular charm about tattoos on thighs that are specific to them. 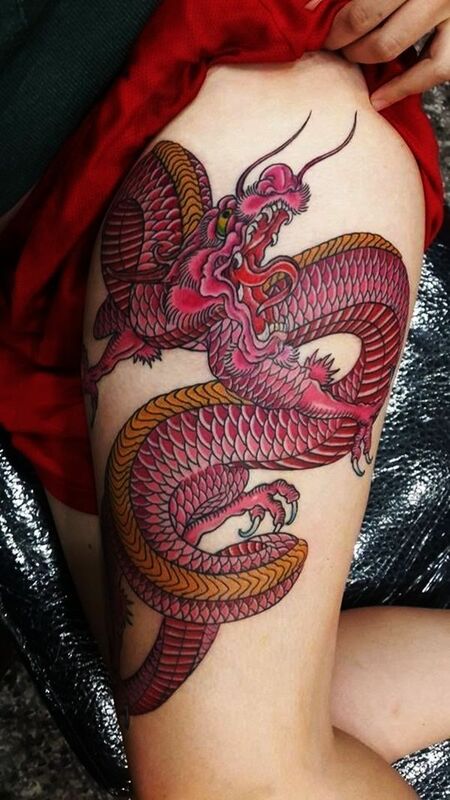 Dragons bring out the power and the sinew while the leg gives a sensual undertone to the aura. 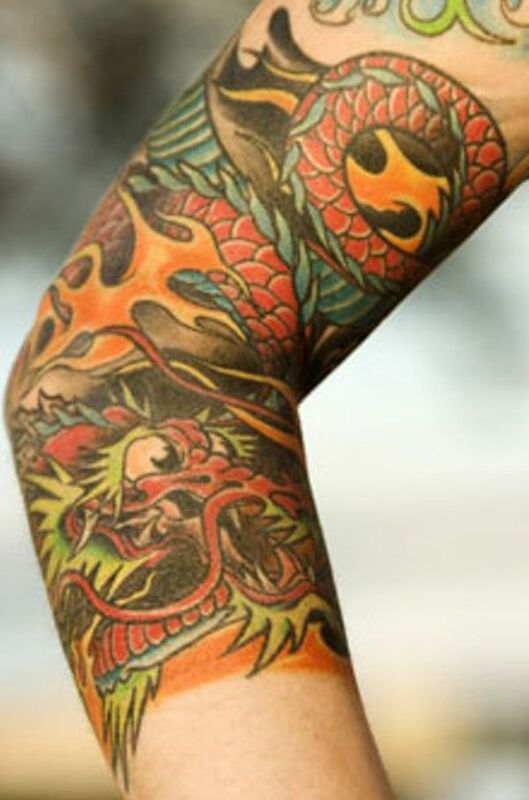 Also, thighs seem to be the sweet middle part for the sizes of tattoo canvas, with a surface area between arms’ and backs’. 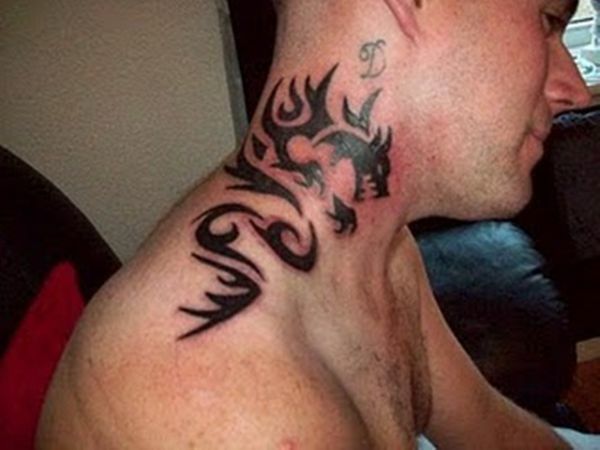 It is also an excellent part to hide a low-profile tattoo if you need to cover them. 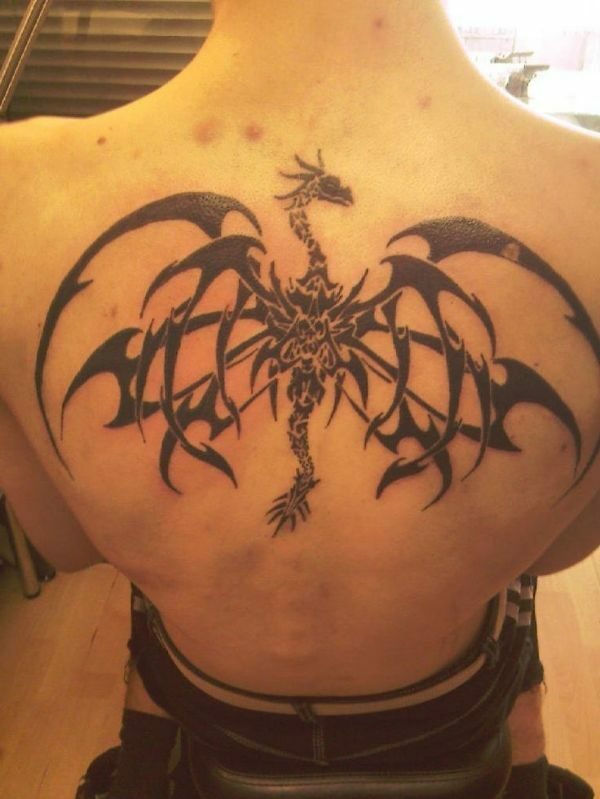 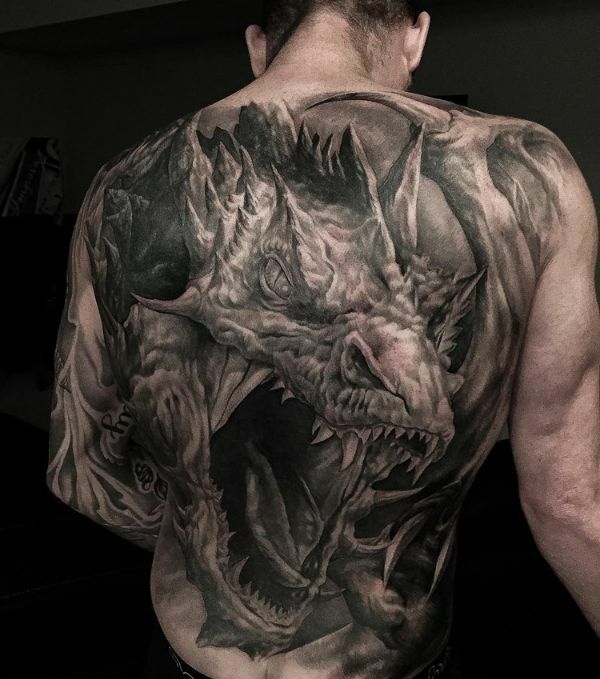 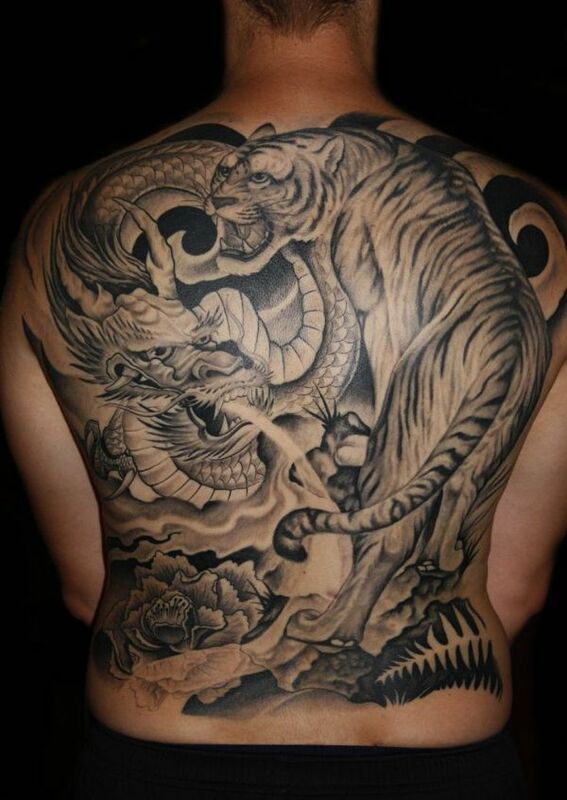 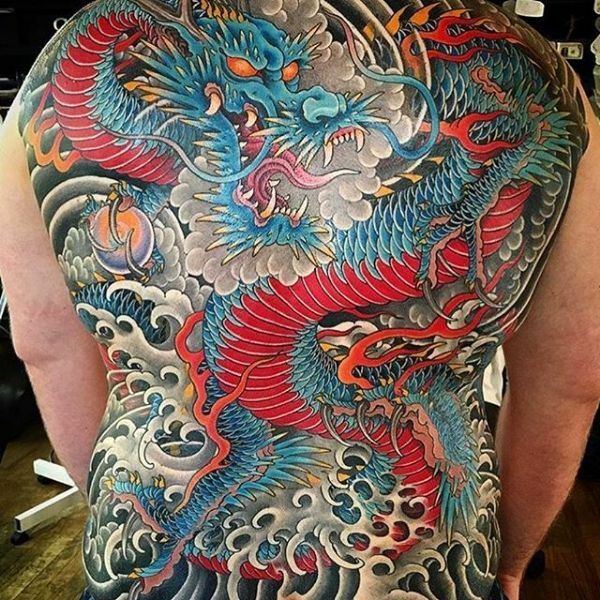 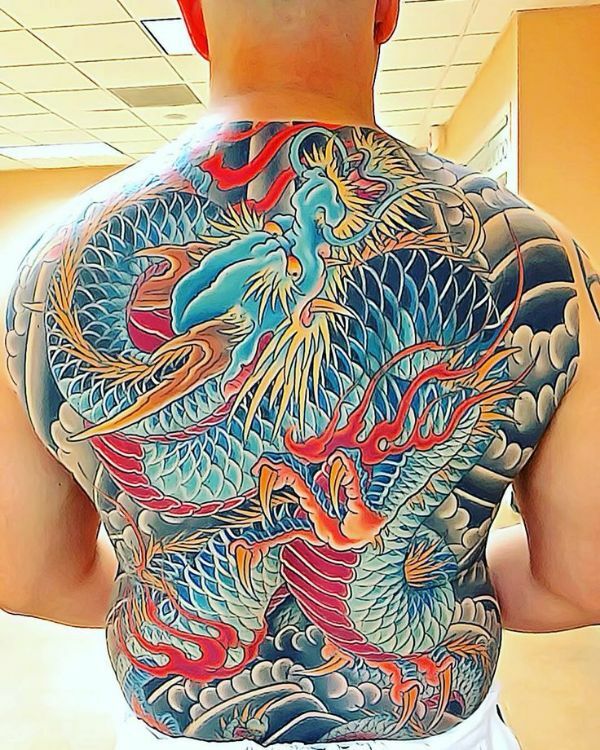 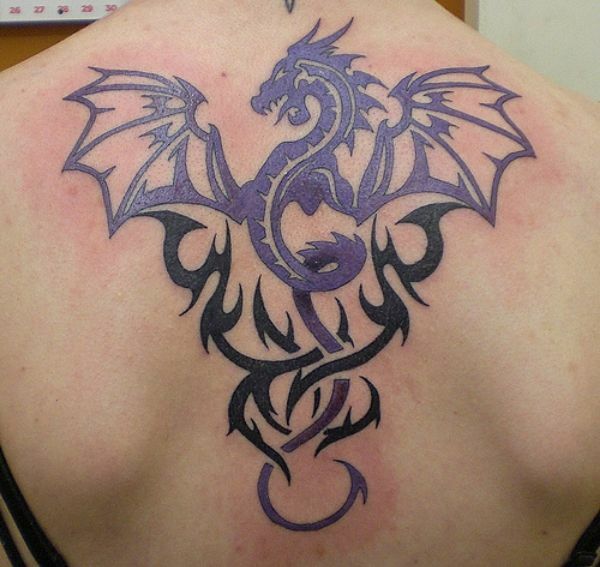 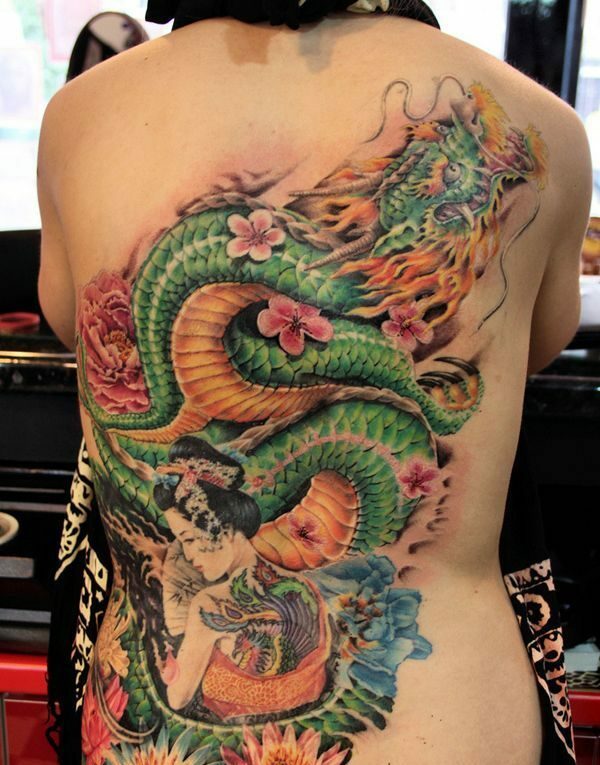 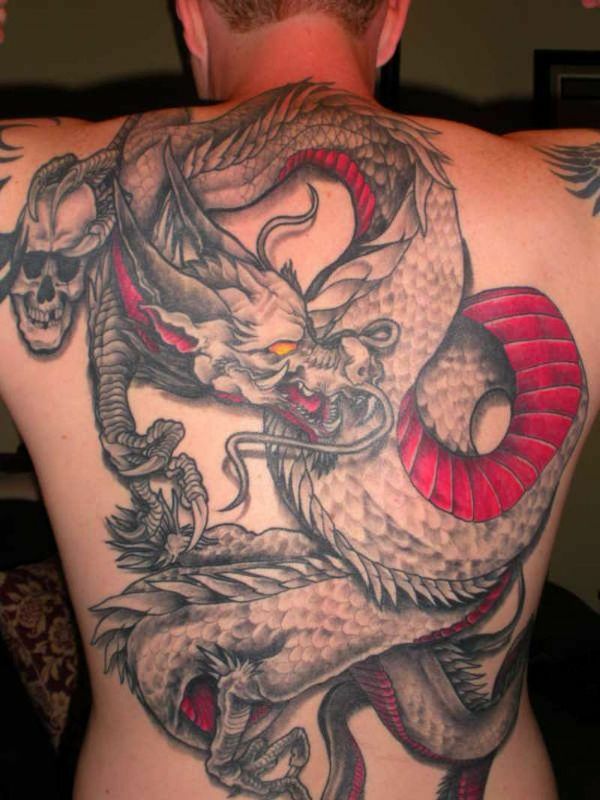 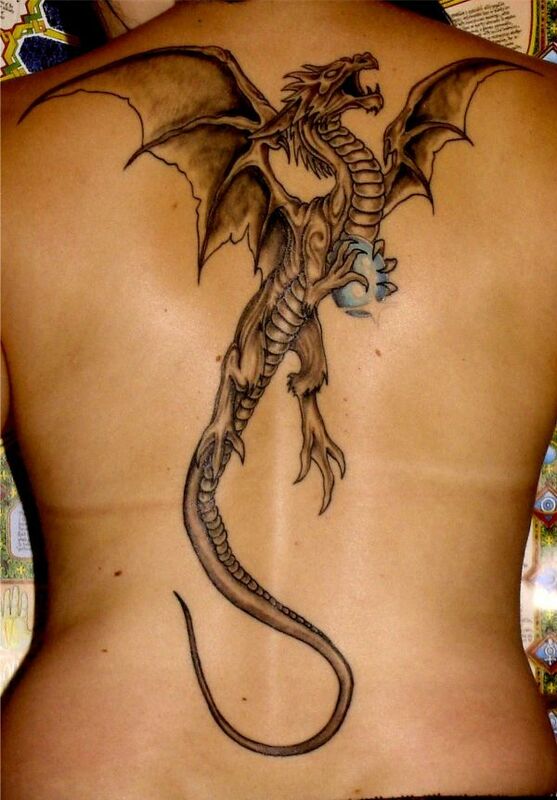 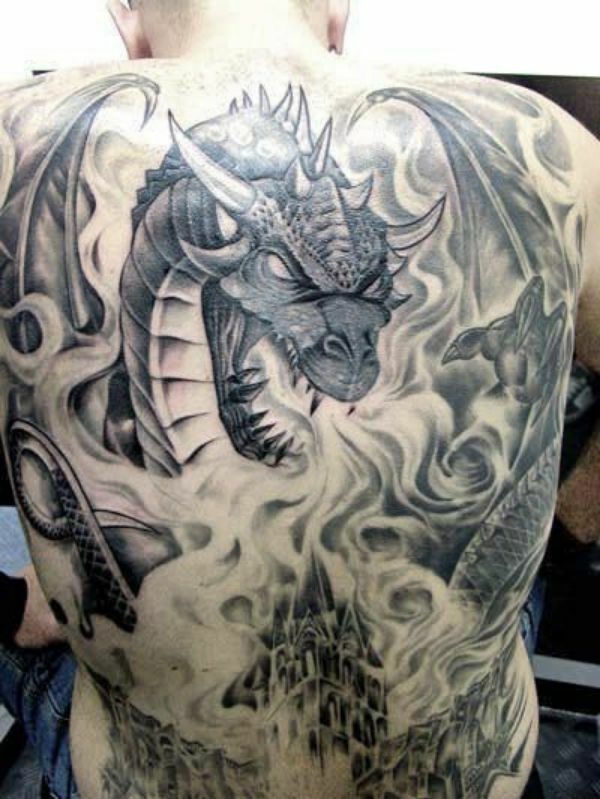 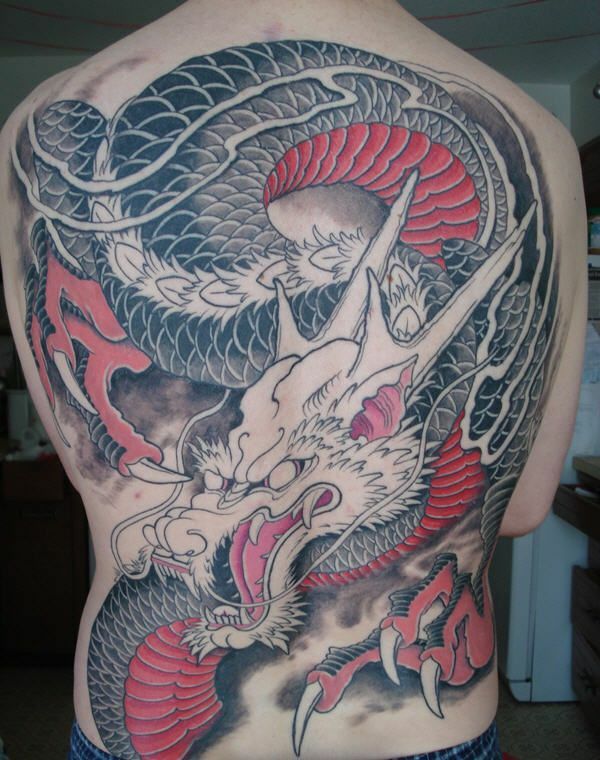 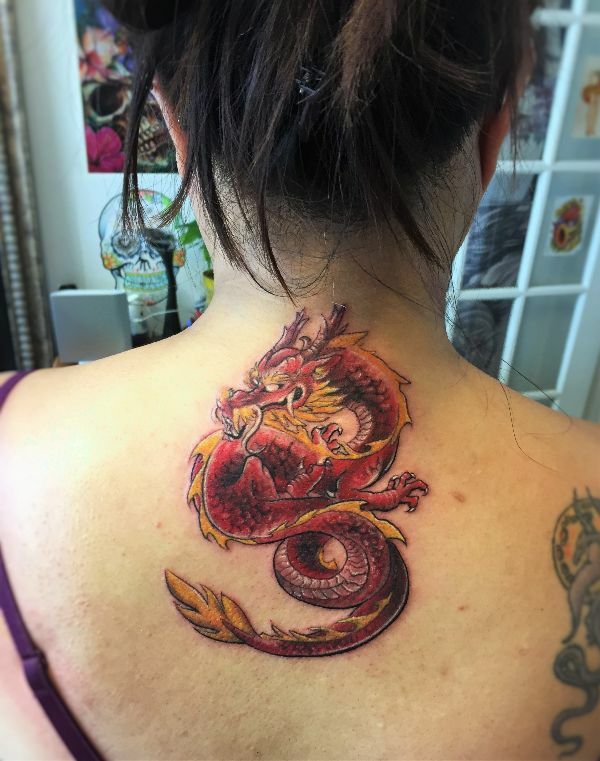 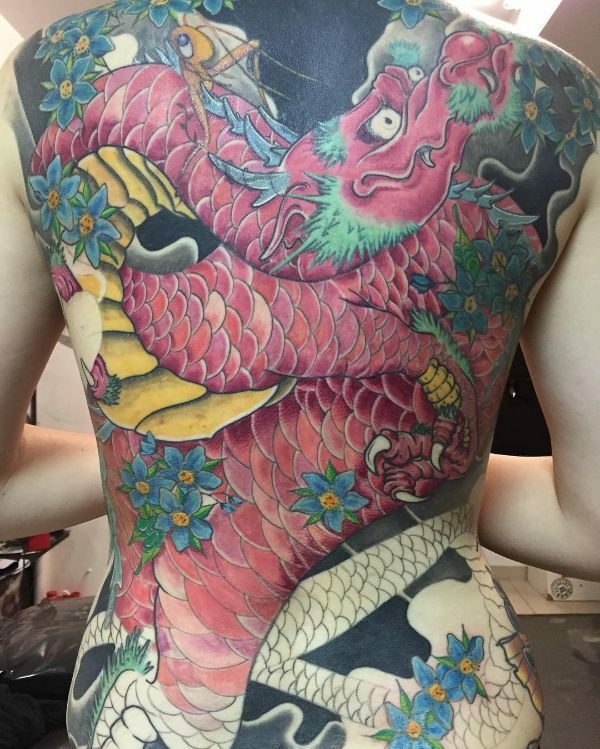 The back is the best place to place full-size dragon tattoos because of the sheer expanse of skin available. 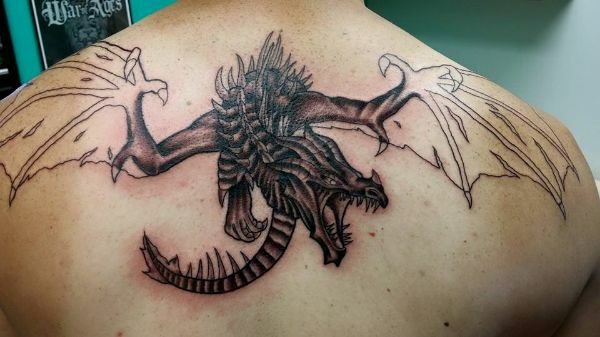 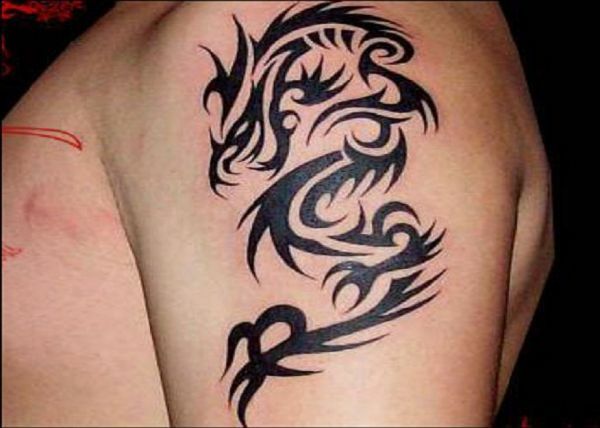 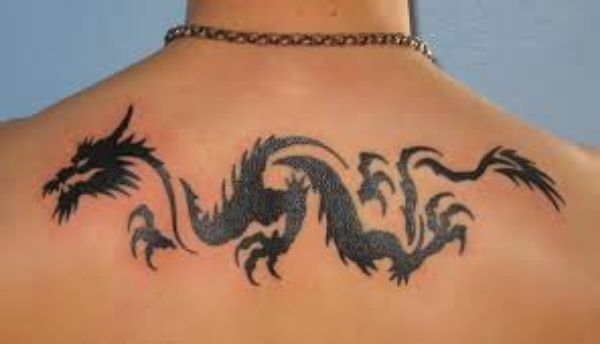 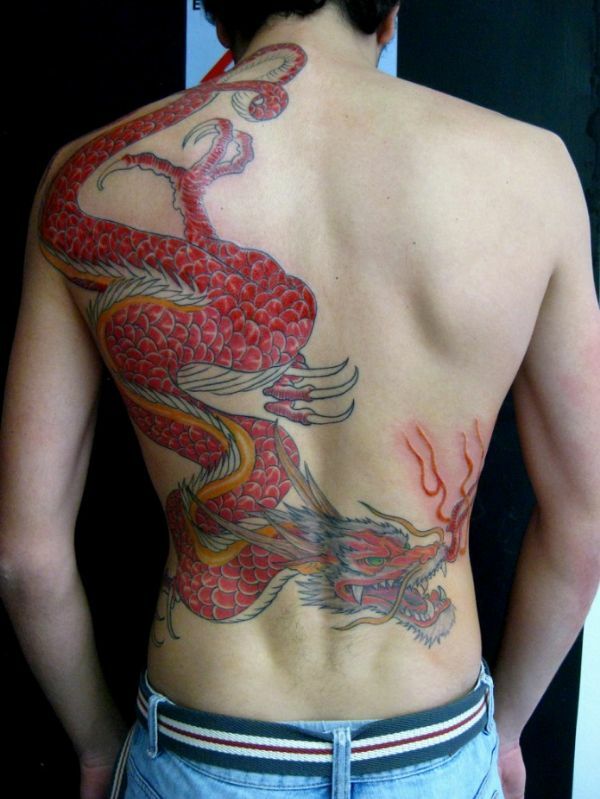 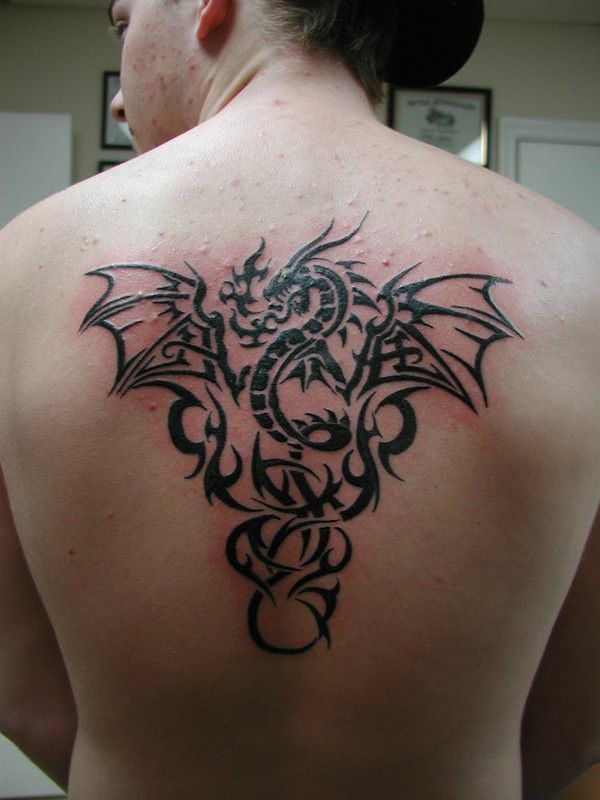 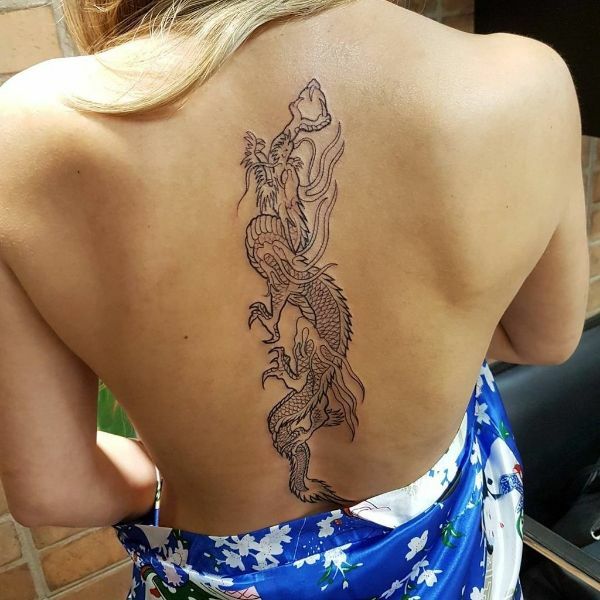 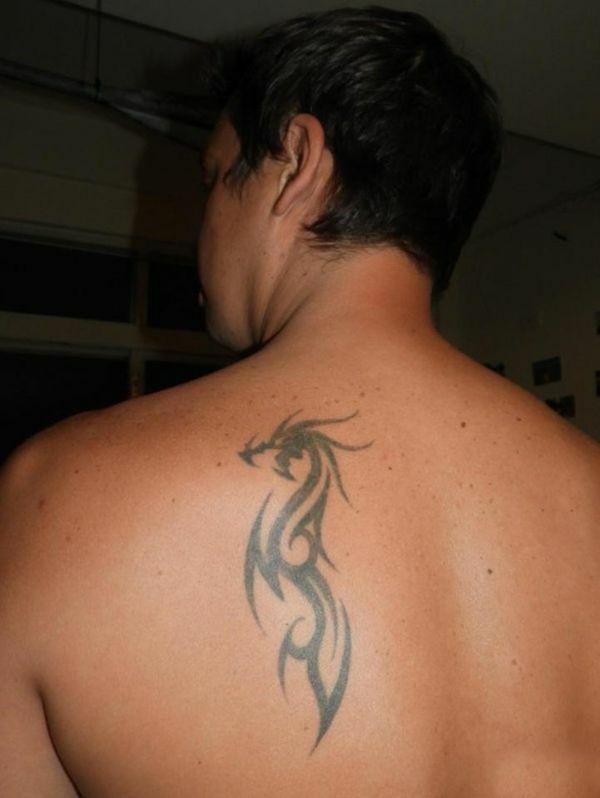 There are those who have dragon tattoos that thoroughly covers the area of the back. 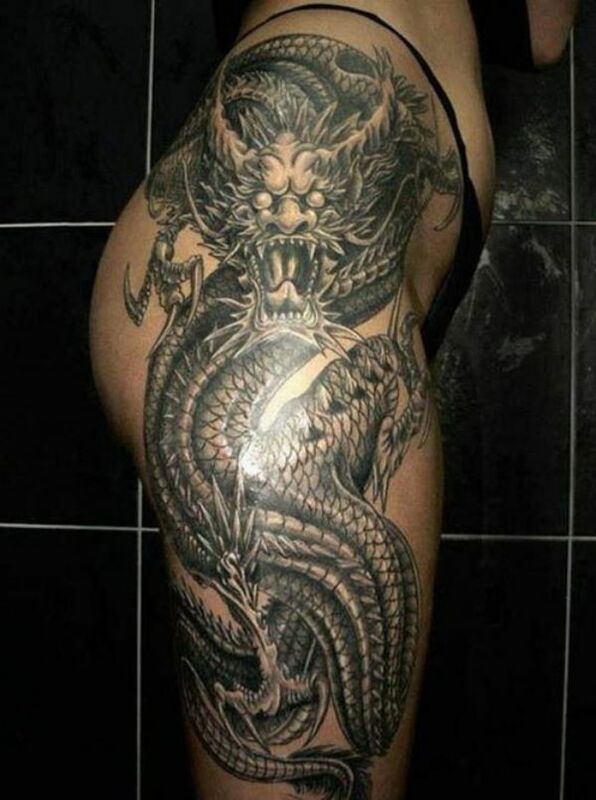 While some have tattoos that might not fully cover it, it is large nonetheless. 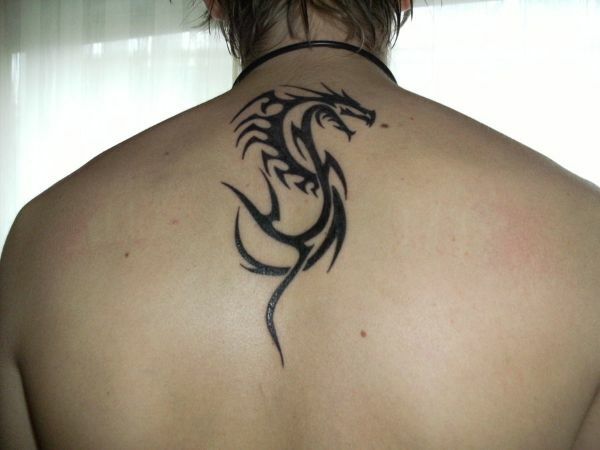 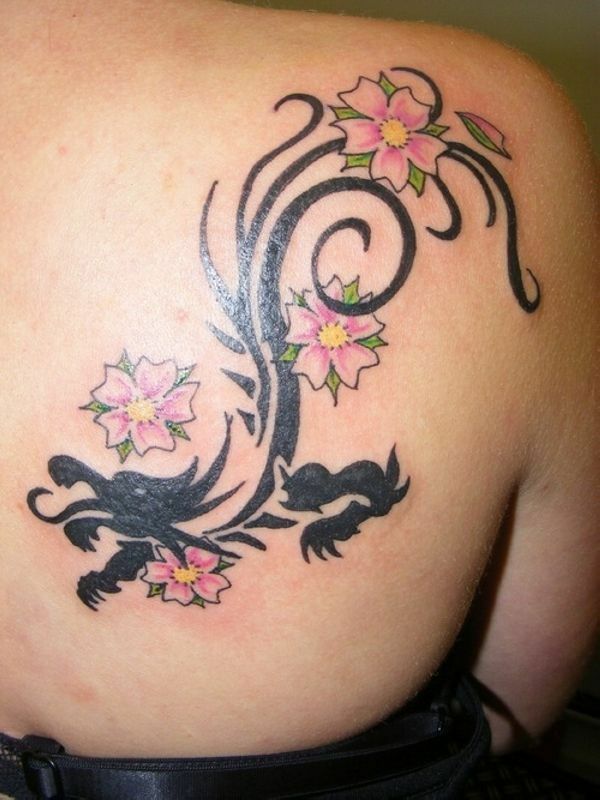 Some can also stay conservative and have only their shoulder blades or half their backs inked. 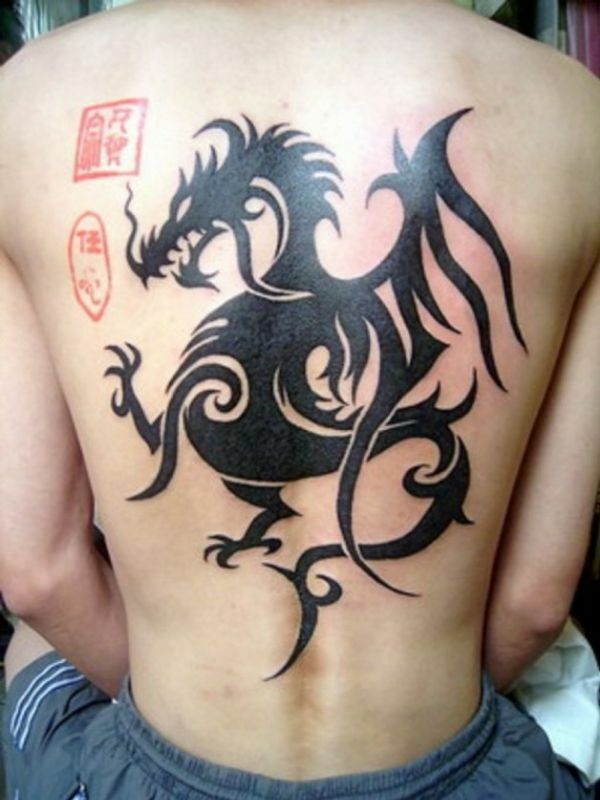 The dragon has varying interpretations per culture, but there is a common conception that we can hold to be universal. 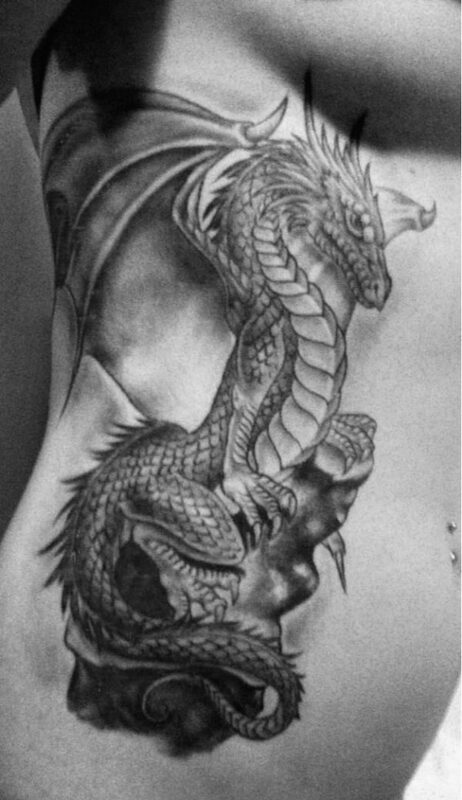 Dragons represent strength, power, and freedom. 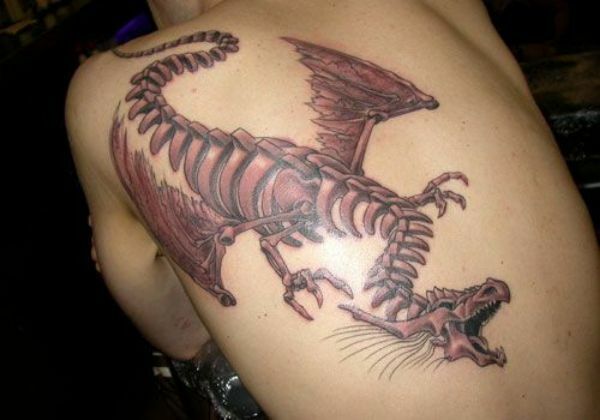 In the confines of its mythical existence, we have feared the full brute of its might. 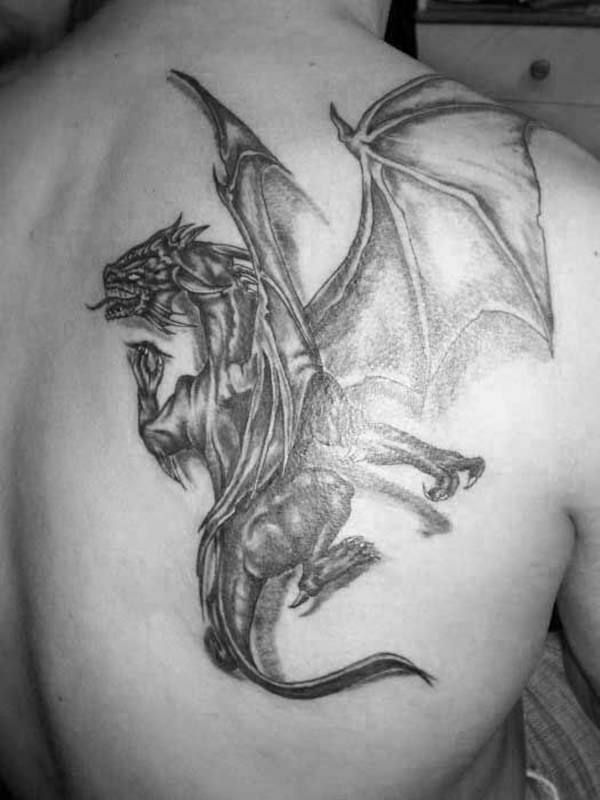 We have revered in its reign, and we have nurtured a mild sense of envy to its ability to enjoy the vast expanse of the sky, whether winged or not. 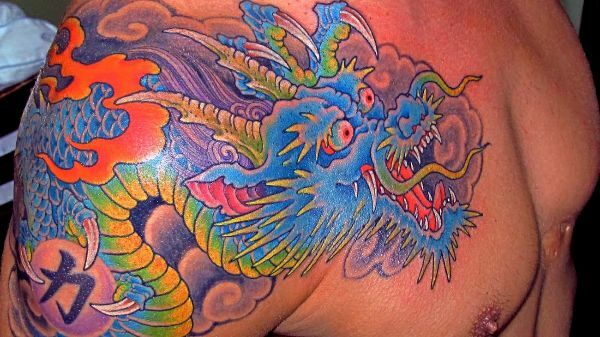 But even if the dragon itself is a figment of human imagination, the values we have associated with it certainly aren’t. 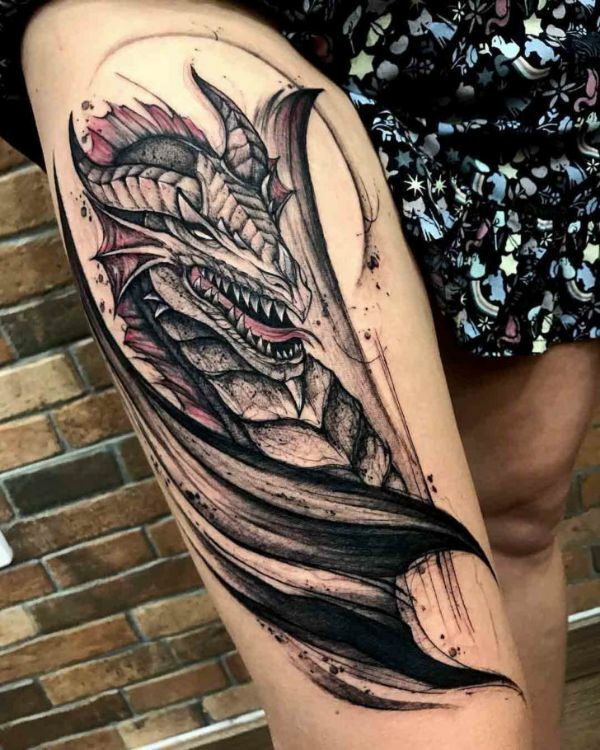 Letting each drop of ink soak into the insides of our skin and instilling the face of the creature with the pain of the pricking needles are physical manifestations of the values we hold on to. 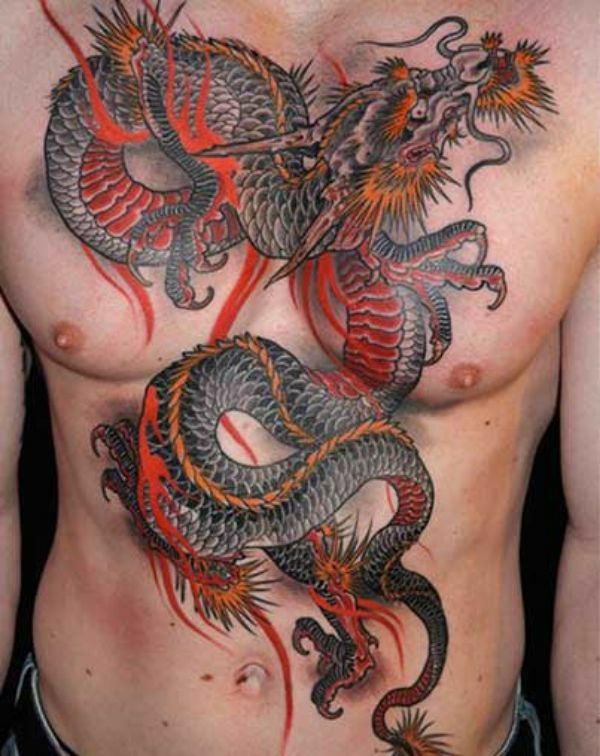 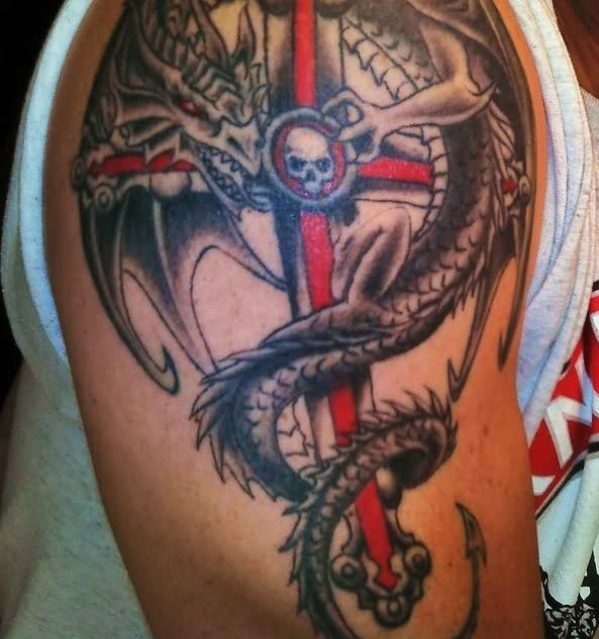 To give a corporal form and deep meaning to these values, the dragon tattoo serves a part of that purpose.